Description: This article focuses on the architectural side of the museums. From renovation of the old wool warehouse to fit the museum layouts, to what each museum brought to the table for its visitors. Museum News shares the story of how the two shared more than just space, they shared ideas. Description: Featured in the in-depth article, is the "remarkable participatory exhibit called City Slice". The exhibit features city lights, cables, working manholes, and of course the centerpiece which is a house that is sliced, showing what houses look like when stripped down. It also goes into the new Museum Wharf exhibit and has many great pictures. Description: Agnes at work in behind-the-scenes in BCM. Description: Anne Butterfield, a BCM campaign assistant, and Duncan Smith talk about the tactics they used to persuade people that the newly chosen Museum Wharf site was a viable option. Description: Anne Butterfield, Duncan Smith, John Stebbins, and Ben Schore are featured in this interview detailing their experiences with each other and how their collaborative meetings set the tone for the project. Description: The days in which BCM was host to activities and performances are listed as well as informational highlights. 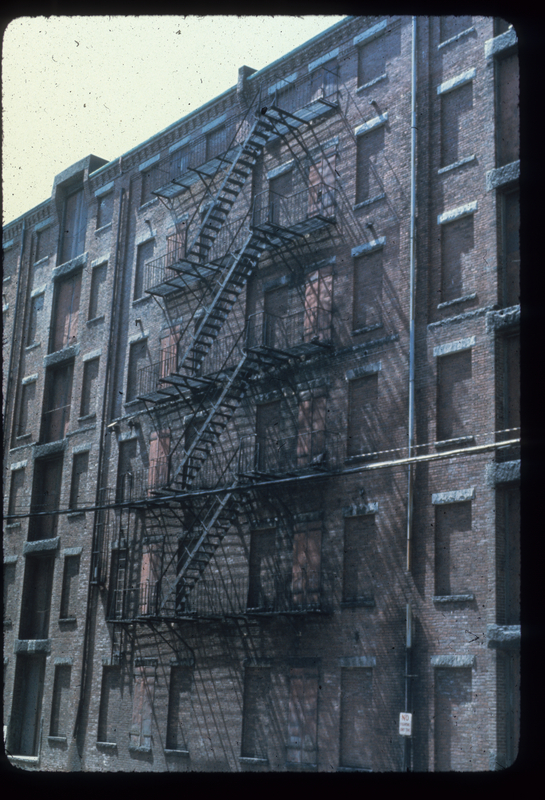 Description: This photo shows the side of the Museum Wharf building exterior, looking upward. The phrase, "Atlas Stores" can be seen, and refers to past lives the old warehouse has had. Description: A picture from above showing the first bay under construction at the new Museum Wharf location. 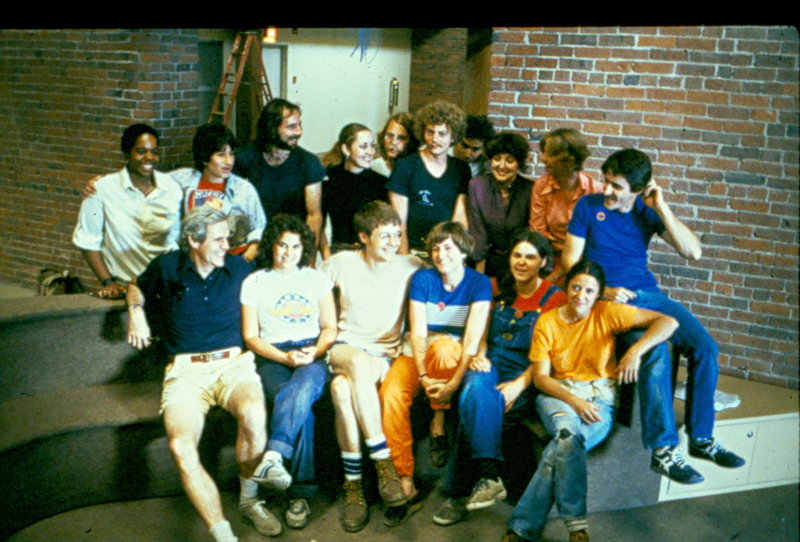 Description: The Museum Wharf staff taking a break while building the Playspace at the new location. Description: Ben Schore, who provided experience and knowledge of the real estate market while a member of the museum board shares his experiences working with Mike Spock, investing his input on the new BCM site and issues that arose with collaborations. Description: This article written by Jim Zien and titled, "Beyond the Generational Gap" speaks about the transformation of BCM under the direction of Mike Spock. The changes and development of the children museum paradigm from passive to interactive is discussed as well as the deep collaborative effort involved in making the changes possible. Description: In this interview, Bill Mayhew talks of his background at MIT and how his knowledge of computers and technology allowed him to help design and set up things like the Museum Wharf's control system. 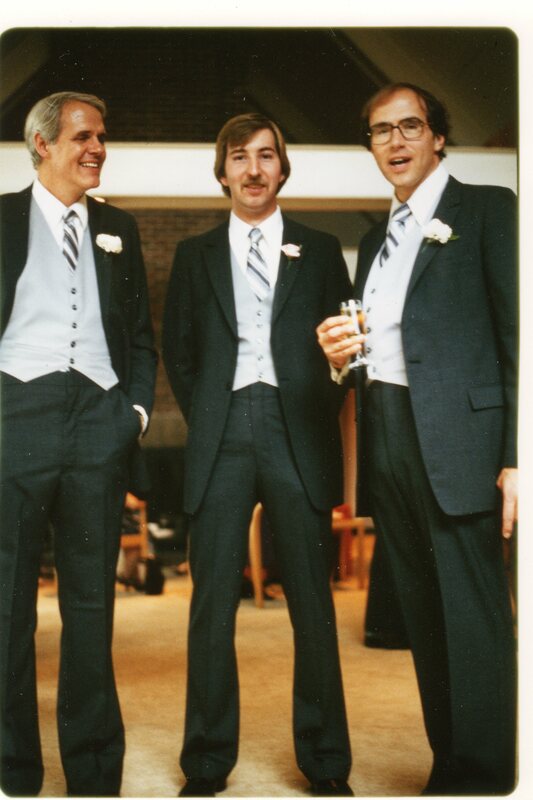 Description: The three ushers at Bill Mayhew's wedding. From left to right they are, Mike Spock, Mike Fitzgerald, and Dave Merrill. Description: What would a Children's Museum be without hosting some birthday parties? This flyer lists all the activities and exhibits good for a birthday party. The various amenities offered by BCM are also listed. 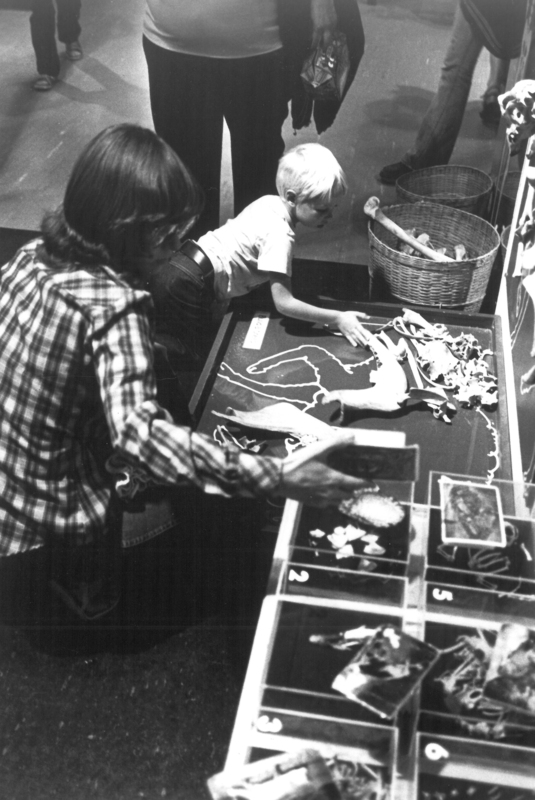 Description: A little boy and an adult explore the activities in the Bones exhibit, a portion of the larger and more encompassing Living Things exhibit that consists of rocks, shells, and a turtle tank. Description: A fact sheet circulated so all know where the Museum stands. The philosophy of BCM, what it does and how is all included in this succinct but detailed bulletin. Description: Funded by the National Endowment for the Arts, this publication explains in great detail all the information and news one would need to known about BCM. With a special introductory note by director Mike Spock, where he reiterates BCM's motto, "I hear and I forget. I see and I remember. I do and I understand." Description: The Computer Museum, backed by Digital Equipment Corporation, and what replaced the Museum of Transportation's old space, won an award in 1996 for have the best software for kids. Description: Jane Jerry writes about transforming a new facility from start to finish, and what it took for her Children's Museum of Houston to go from empty building to thriving museum and truly reach its potential. This illustrates the ways BCM influenced others, and how many Children's museums go through the same struggles. Description: The architectural firm that was commissioned by BCM is shown here in a handout. They talk about how they left their hidden mark on BCM and explain another site they were involved with in Boston. Description: A child enjoys the Caribbean market exhibit at BCM; here she weighs some of the food featured in the market on the scale. This was part of the larger Meeting Ground exhibit. Multi-cultural learning and understand were key parts of BCM's mission for children. 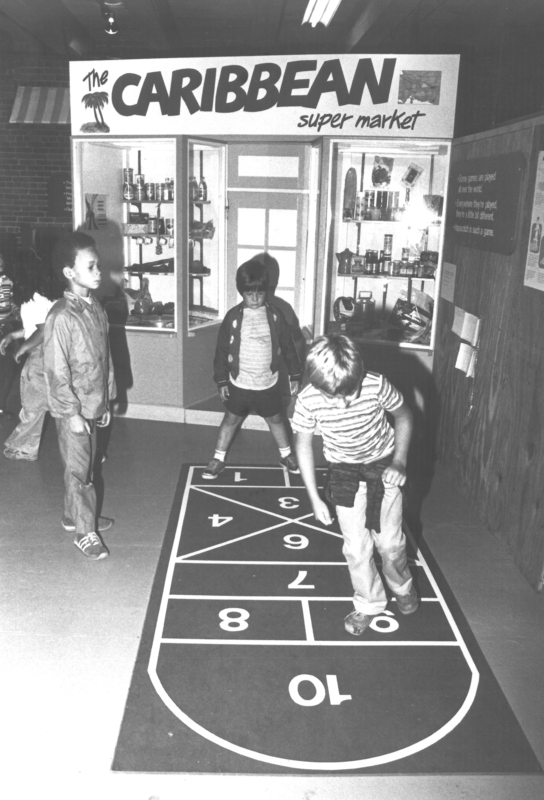 Description: A group of children enjoy playing a game outside the Caribbean market exhibit at BCM. This was part of the larger Meeting Ground exhibit. 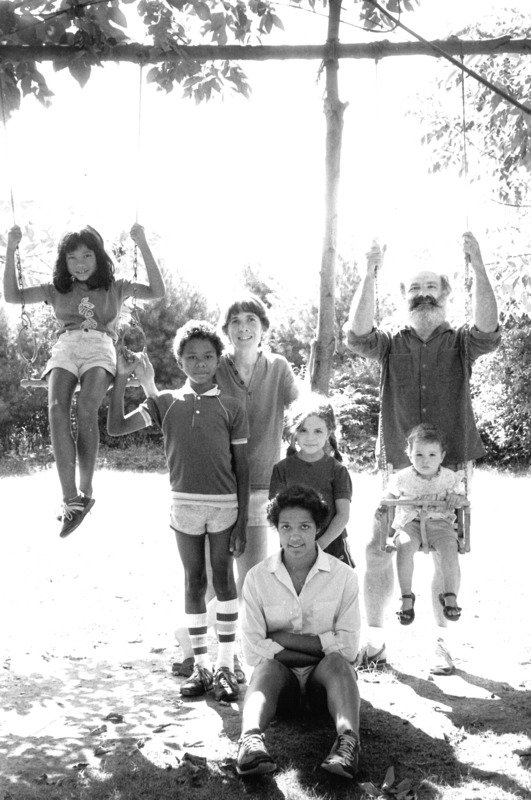 Multi-cultural learning and understand were key parts of BCM's mission for children. Description: A number of children play in Tom Luckey's climbers. Touted as being both "safe and crazy", these provided plenty of entertainment for children visiting the Museum Wharf. Description: The BCM plays host to a Children's festival including activities like making kites, trying calligraphy, and a fishing game. Description: This flyer announces Chinese festival day with activities including storytelling, dancing and games. The second page shows the flyer in the Chinese language. Description: Chuck Redmon, an architect for the Museum Wharf, and Dan Prigmore discuss the initial concerns with the chosen Boston waterfront location due to it being in more of an earthquake zone than the Jamaica Plain location. Description: Chuck Redmon describes his role, working with Cambridge Seven, in finding and setting up BCM's new home at the Museum Wharf. Description: Chuck Redmon talks about the architectural studies that went on while BCM was choosing their new site. Blackstone Block is addressed in this interview. Description: The City Slice exhibit under construction. Description: This shows the Grandparent's House in the City Slice exhibit. 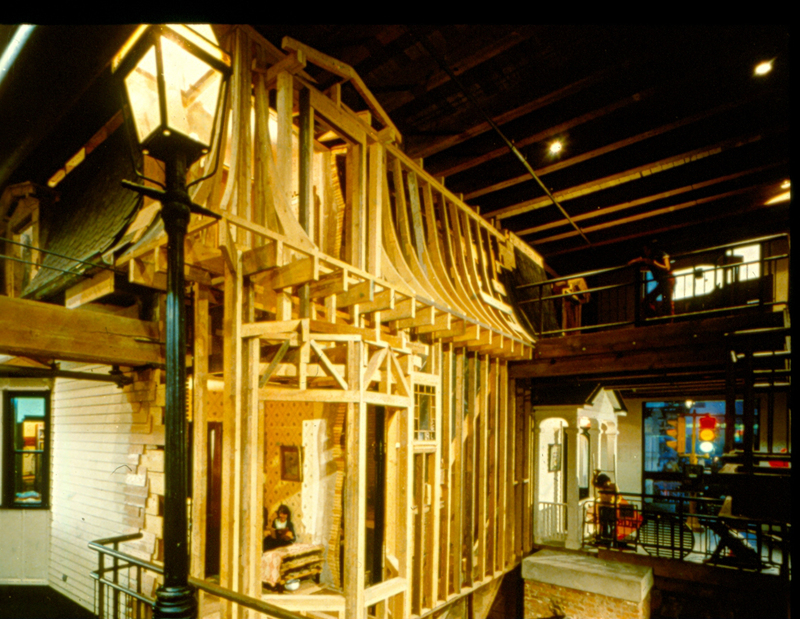 The faade is intentionally left unfinished so that children can see the inner-workings of a house. City Slice also featured a subway card and street lights (also pictured) and other items one would see in a city, perhaps even Boston. 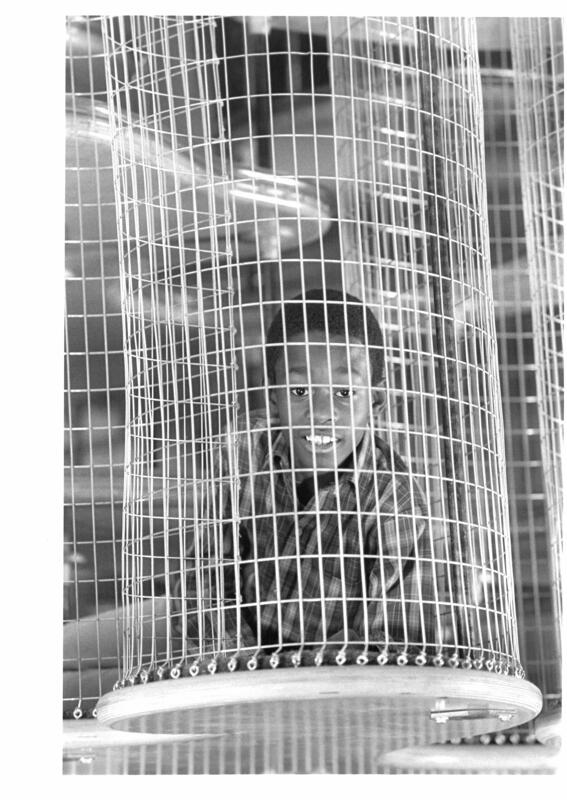 Description: A young boy is shown in this picture enjoying a climbing sculpture within an exhibit at the Museum Wharf. 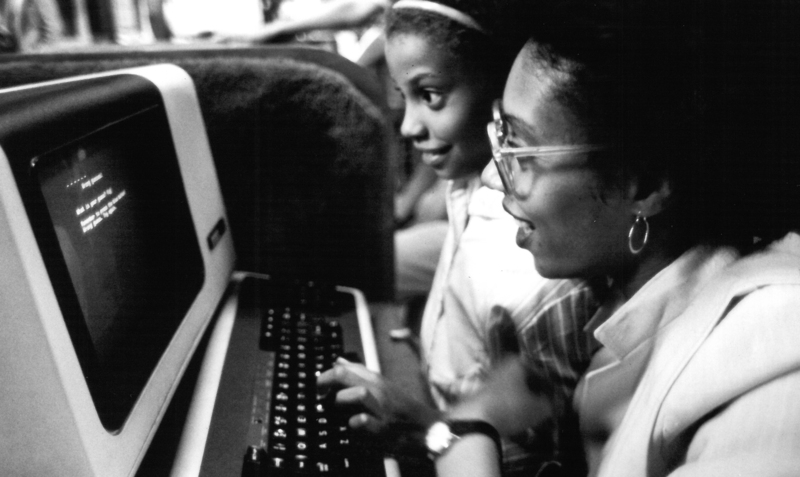 Description: A mother and daughter look on as they enjoy the computer exhibit at the Museum Wharf. 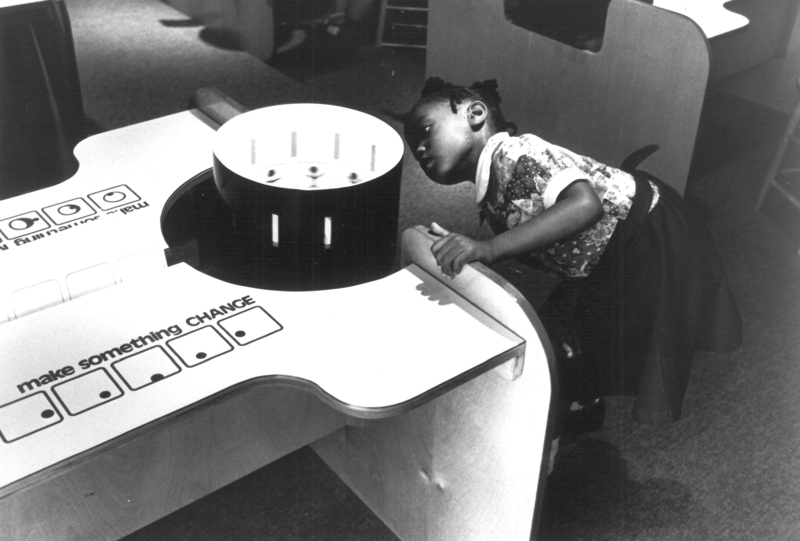 BCM eventually won an award in 1996 for the utilization of computers within their museum paradigm. Description: A flyer for the annual report on the Computer Museum for the fiscal year of 1996. Connected to BCM, it too valued the task of being a reputable and important tool to educate children. Financial reports, letters from board members and announcements about happenings around the museum are included in this publication. 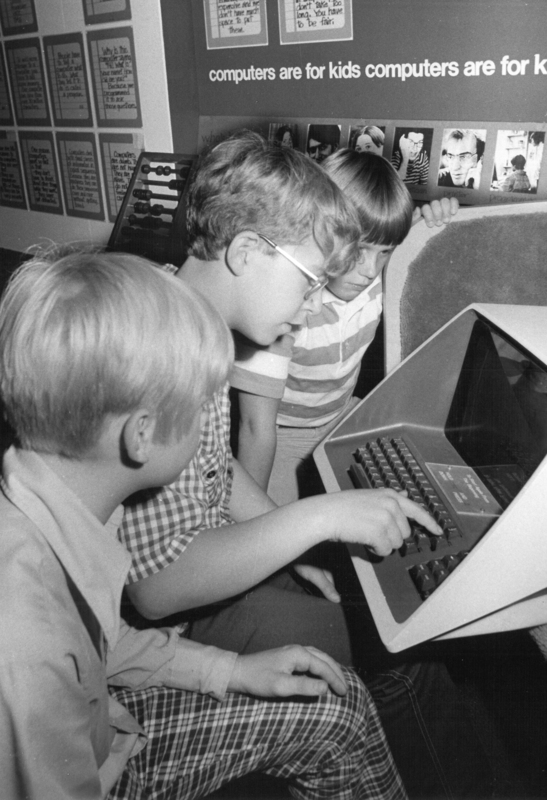 Description: Two children and one adult look on as one child enjoys the computer exhibit. Later evolutions of this exhibit would win an award. 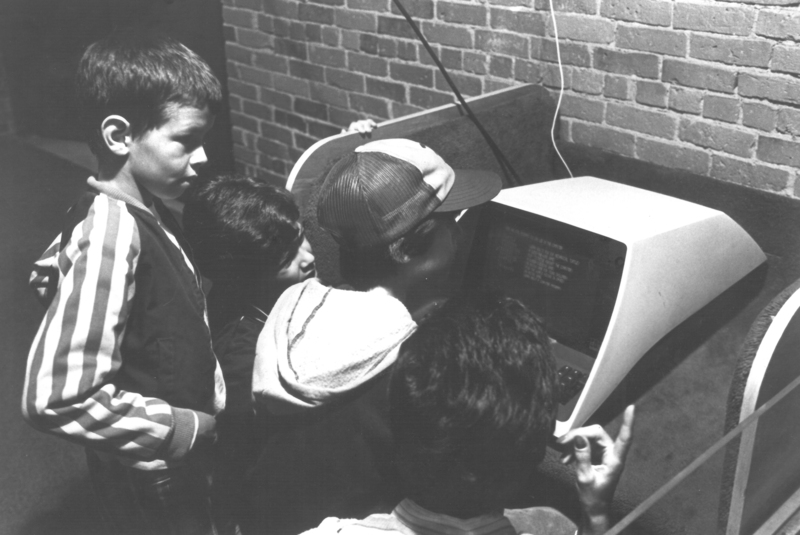 Description: Three young boys gather around a computer terminal at the computer exhibit at BCM. Though much different than our computers today, these still were filled with fun games and encouraged fun education. Description: Dan Prigmore talks about the Museum Wharf site around the time BCM purchased it, and what kind of real estate deal it was. David Burnham, a museum trustee, explains how he originally came across the old wool warehouse that eventually became the Museum Wharf. Description: Dan Prigmore, the project manager for the move from Jamaica Plain to Museum Wharf, and Duncan Smith talk about their experiences helping Mike Spock embark on the real estate market. They speak of the struggles that ensued trying to master both a big move and a big investment. 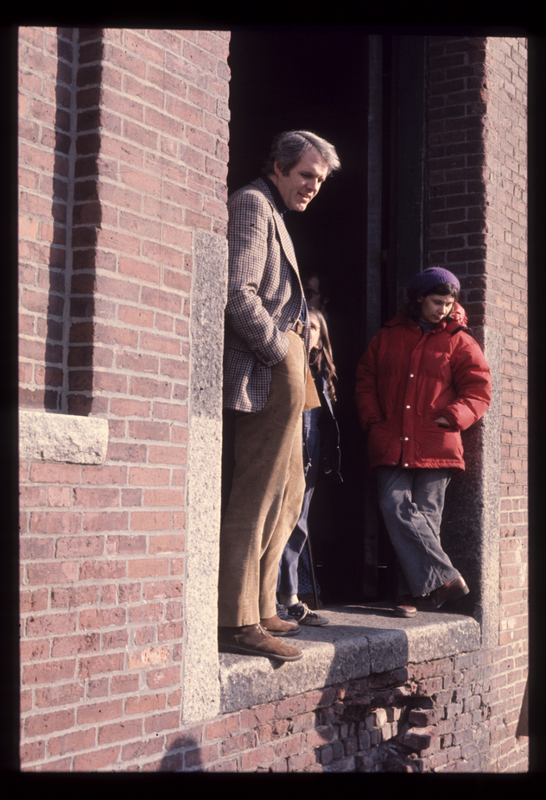 Description: David Burnham, who was instrumental in finding the warehouse that became the Museum Wharf site, details his role and the enormous amount of collaboration that went into BCM's move from Jamaica Plain to the waterfront location. Description: This flyer describes the special hours of operations for the upcoming holidays, the multi-cultural event known as Decemberfest, and holiday-themed workshops and performances. Description: BCM celebrates Dental Health day, hosting a tooth brush swap, have the chance to listen to a storyteller and get to use the fun flossing teaching model called "Big Mouth". 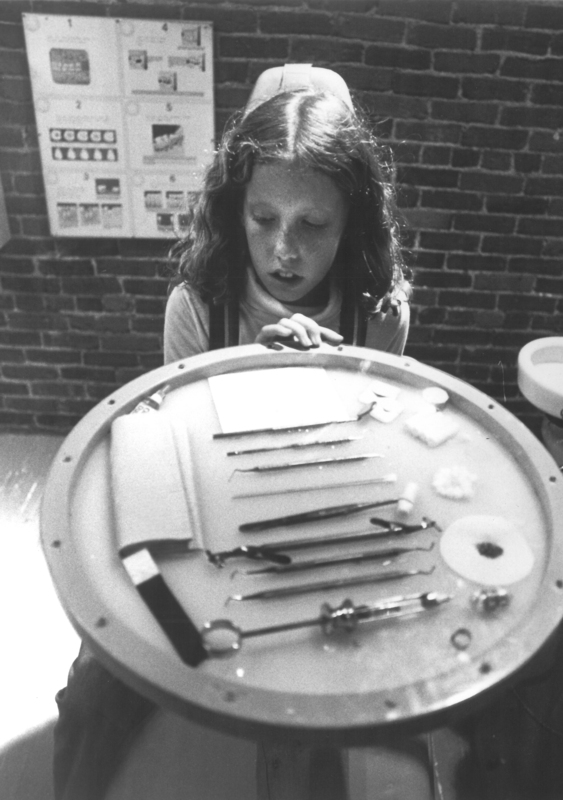 Description: A girl explores the Dentist Office exhibit. Part of the larger Work exhibit, which explores the world of work through hands-on activities centered around the Congress Street Suprette and the Health Care Clinic. Description: This booklet outlines everything broadly that BCM is and was about, and any information about their finances and lists exhibits. The title is a play on the common phrase of "do not touch" seen at museums and art galleries across the nation, BCM strives to allow and encourage children to interact with the exhibits. 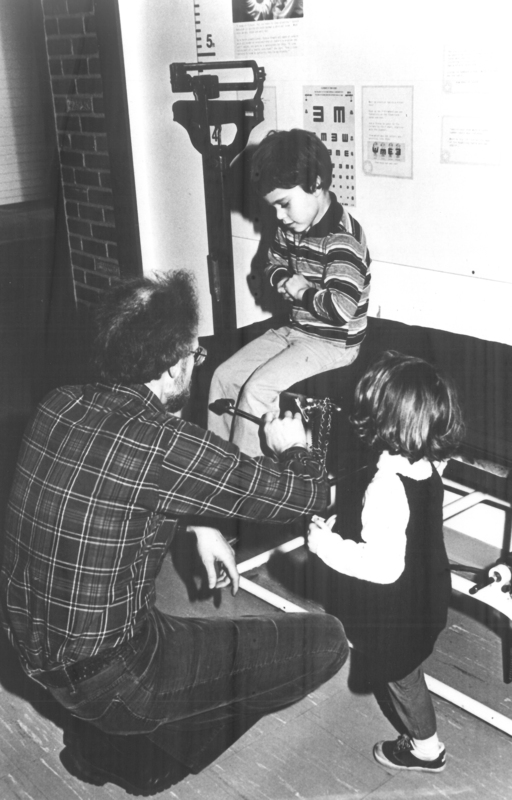 Description: One child participates in the Doctor's office exhibit while an adult another child look on. Part of the larger Work Exhibit, children were able to participate in everyday working situations to better understand work in general. 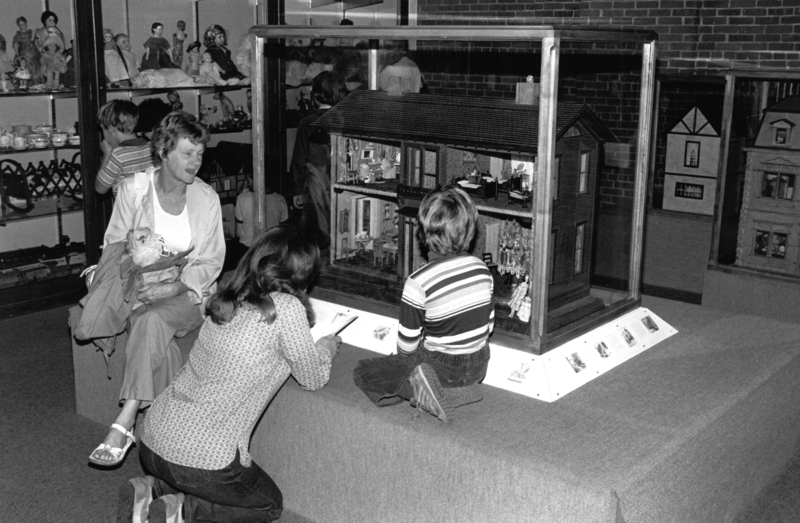 Description: A child and two adults enjoy one of the dollhouses which is in the larger Ruth Harmony Green Hall of Toys exhibit. Both adults and children enjoyed this exhibit showcasing a sort of history of toys. Description: Rough draft of a document outlining the chronology of cultural programs by Pat Steuert and Dottie Merrill. Description: Children are able to try on clothes and have fun playing dress up within the Grandmother's Attic exhibit at the Museum Wharf. 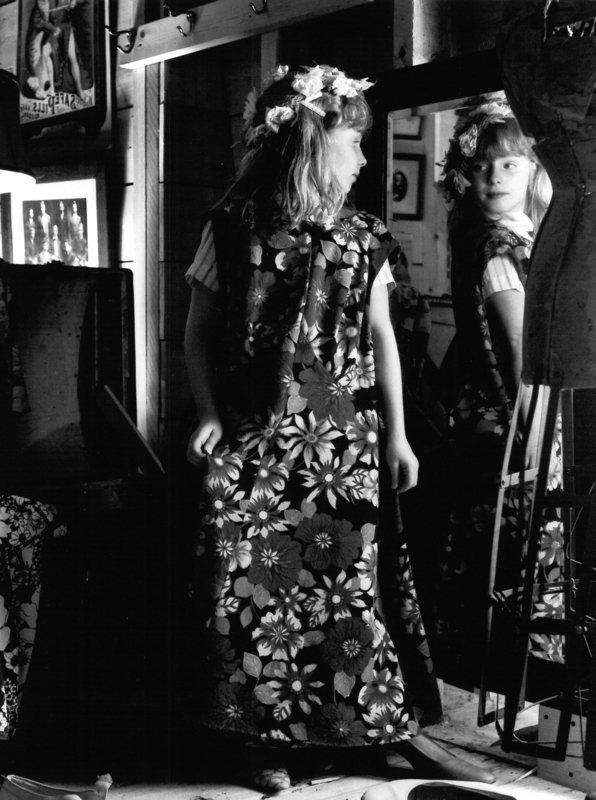 Pictured here is a little girl admiring the dress she has put on. Description: Duncan Smith talks about his experiences working summers at the Boston Fish Piers, which allowed him to get to know Boston neighborhoods such as South Boston and Jamaica Plain. John Stebbins, an architect for the Museum Wharf talks about the decision to move to South Boston. Description: Duncan Smith talks largely about the relationship between the Museum of Transportation and BCM, and how eventually the two parted ways. Description: An invitation for the dedication program for a new, permanent exploring the Museum's past. A behind the scenes tour and reception were also part of the event. 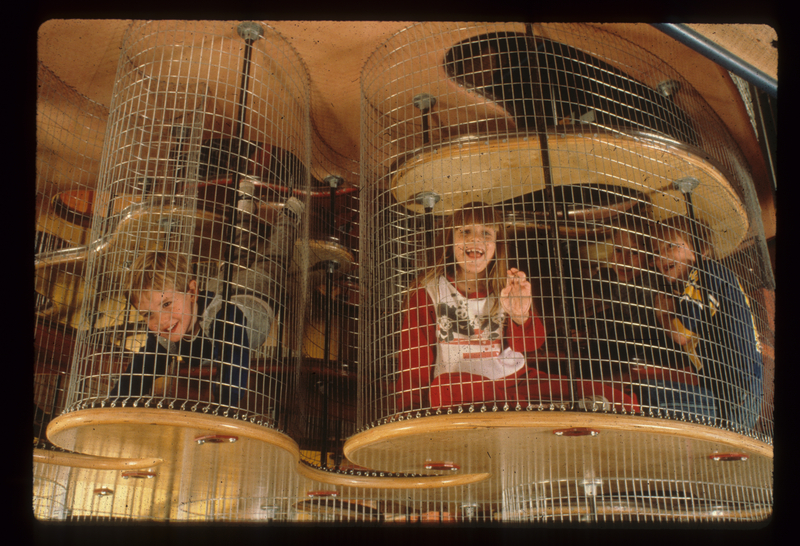 Description: Children enjoy the factory exhibit here in this photograph. The factory exhibit portion in this photo let young workers assemble spinning tops in an assembly-line fashion. To read more about this exhibit and details of all the others available in the 80s, search chapter 10 archive for the fact sheet files! Description: This newsletter, aimed for the public, mentions all of the new workshops, exhibits and specials in the fall months of 1978. General information including hours, admission costs and memberships are included as well as updates on the Museum Wharf. Description: A family takes a moment from swinging to pose for a photograph. 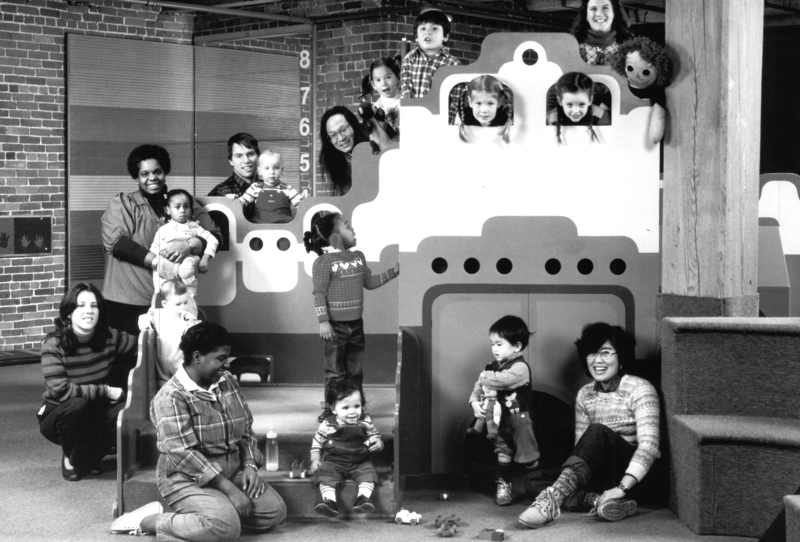 Description: A number of children and their families are featured posing in BCM's Playspace exhibit. A large and encompassing exhibit, it catered mainly to preschoolers and their families. Description: A pamphlet highlighting the Kidscook Festival. Large corporate and private sponsorship allowed for many fun activates, the TV character Arthur also made an appearance.Hosted in tandem by BCM and The Anthony Spinazzola Foundation, children were given the chance to cook with a variety of chefs. 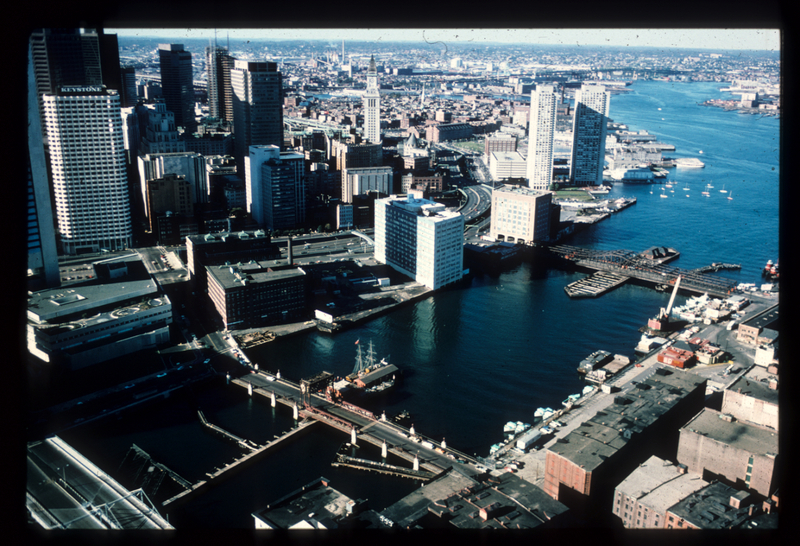 Description: A photo showing downtown Boston and Fort Point Channel, looking north. BCM is in the bottom right of the picture. Description: This flyer lists the different performers and type of performances in the months of February and March. Admission prices and times are listed. Description: This flyer lists the different performers and type of performances in the months of May and June. Admission prices and times are listed. Description: This flyer lists the different performers and type of performances in the months of July and August. Admission prices and times are listed. Description: This flyer lists the different performers and type of performances in the months of October and November. Admission prices and times are listed. 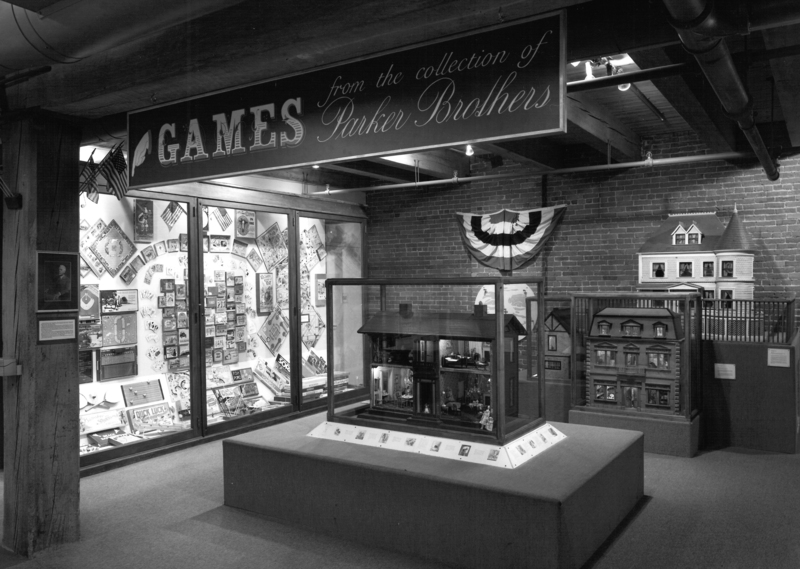 Description: A photograph of the Games Exhibit at the Museum Wharf in the larger Ruth Harmony Green Hall of Toys exhibit. The glass case on the left side of the photo holds games from Parker Brothers, as the sign indicates. Description: This flyer lists the dates and times for a new series of puppet shows every Sunday and BCM. The schedule, admission prices and directions are listed. 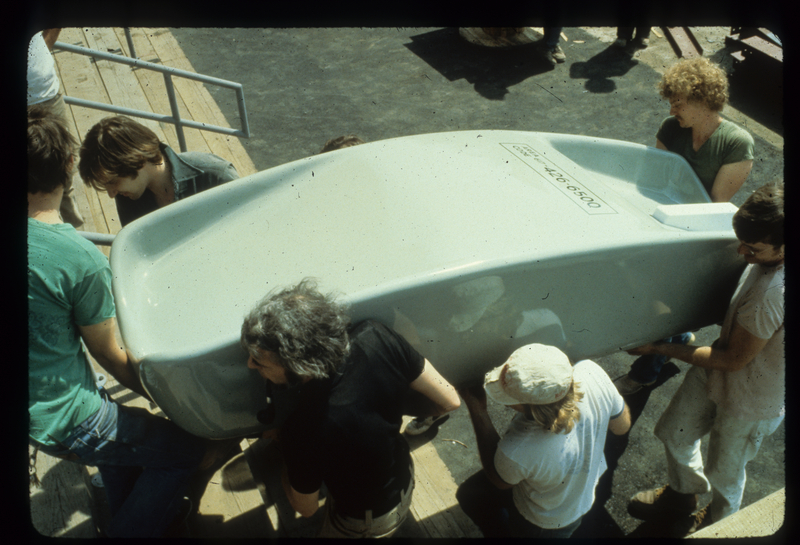 Description: A group of BCM employees use team effort to bring in the base for the phone that belongs in the Giant's desk exhibit. 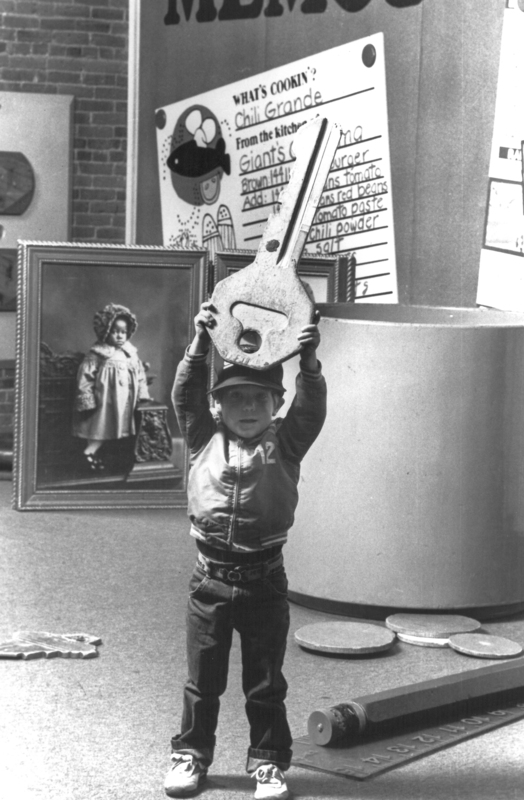 Description: A young BCM attendee impressively shows off a key from the Giant's Desk Top exhibit. 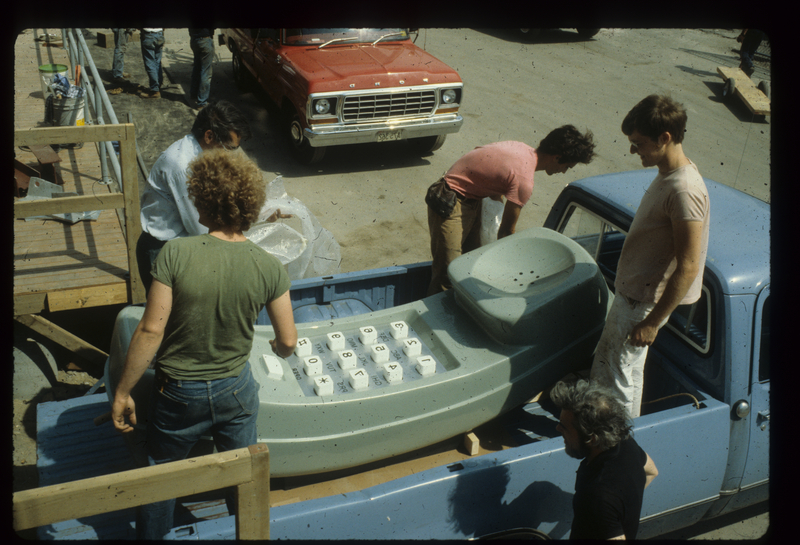 Description: This photo shows the museum staff backing up a truck to begin the process of moving the top portion of a giant telephone for the Giant's Desk exhibit. Description: This photo shows a little girl playing on a giant telephone. A part of the Giant's Desk Top exhibit, where everything is twelve times normal size, including paper clips, postcard and telephone. 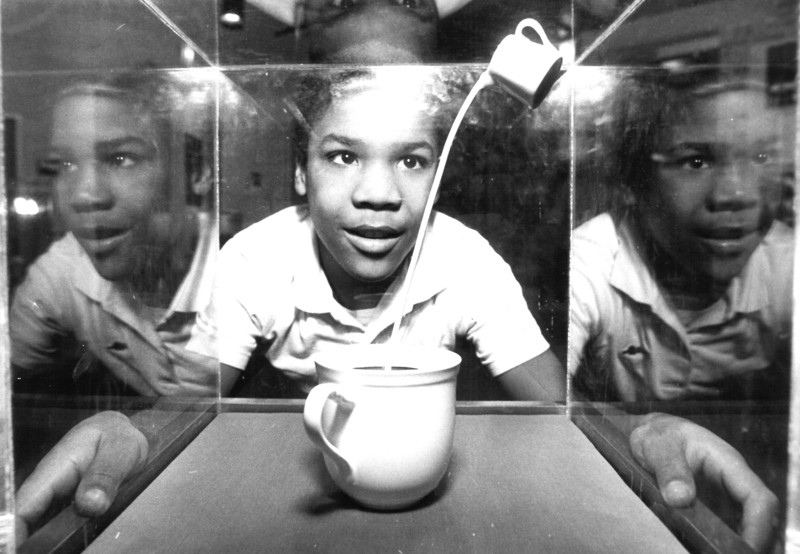 Description: A young boy looks on in curiosity as an exhibit cube shows creamer being poured into a cup of coffee. 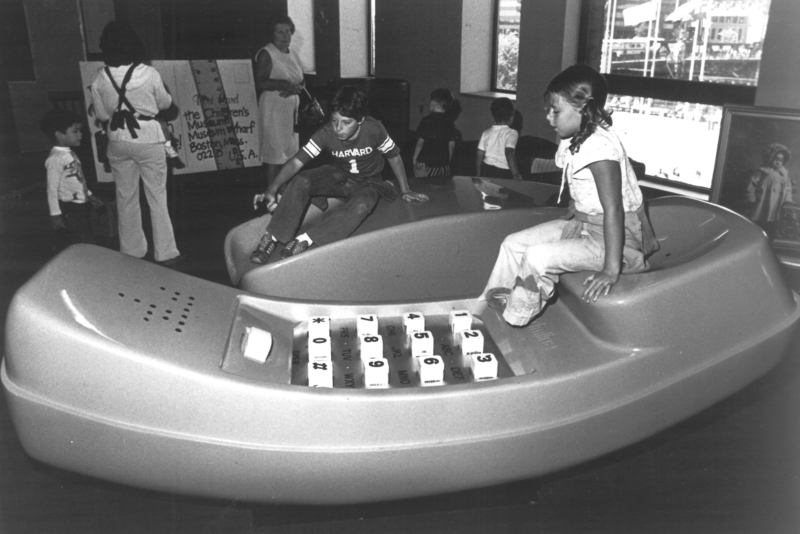 Description: As featured in the People magazine article about Mike Spock, this photo shows kids enjoying the Giant's desk exhibit at the Museum Wharf. Description: A wide shot photo of the Giant's desk exhibit. Shown here is the phone that other pictures depict being brought into the Museum by staffers. 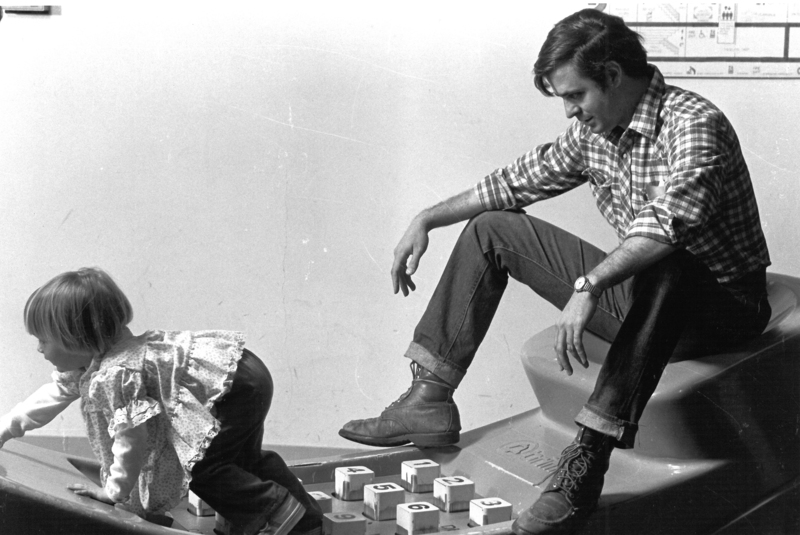 Description: A father and daughter enjoy one half of the phone in the Giant's Desktop Exhibit. 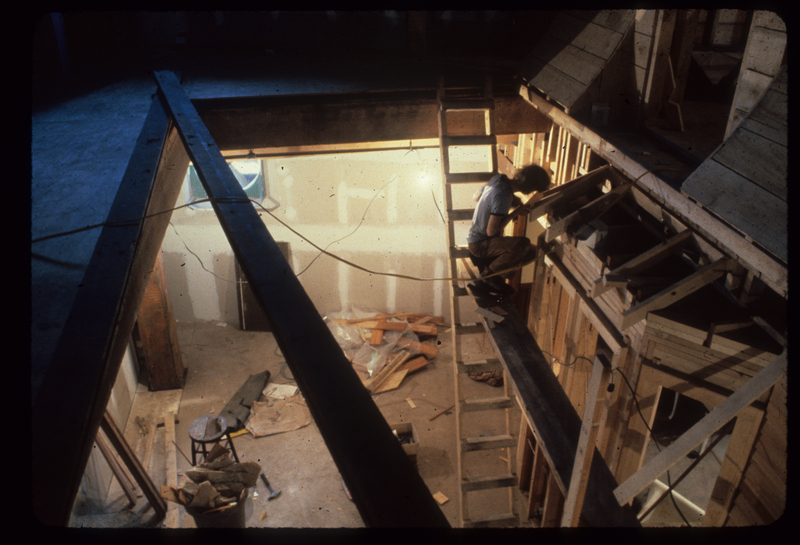 Description: A photo showing Grandma's Attic exhibit being constructed. 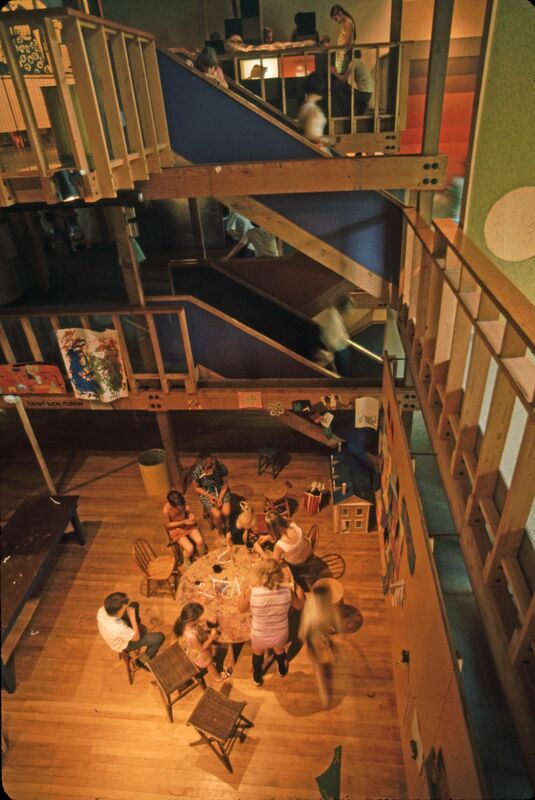 In this exhibit children could play dress up and see all the fun that the attic had to offer. This was part of the larger City Slice Exhibit. 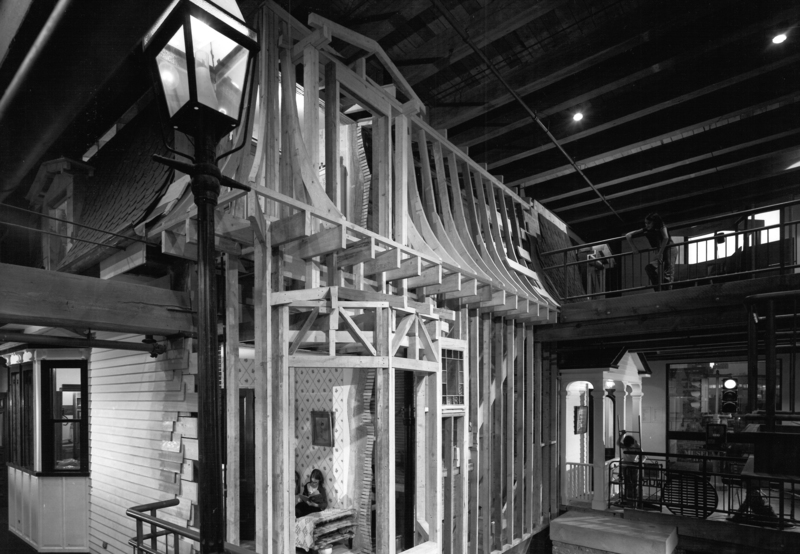 Description: A wider exterior shot of the construction of Grandma's house that included the exhibit of Grandma's Attic. This was part of the larger City Slice Exhibit. 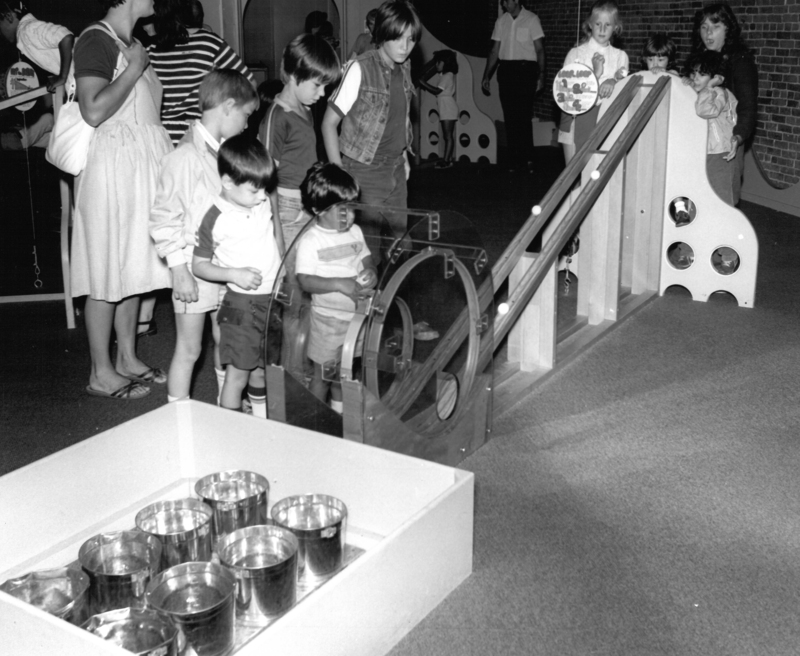 Description: Children engage in activities in the Grandma's Attic exhibit, part of the City Slice exhibit. Already in costume from the dress up portion of the exhibit, they are now partaking in tasks such as ironing and mixing a large mixing bowl. Description: Grandma's attic, a part of the sliced house (showcased fully in pictures and description in "A Slice of City in the Cross Section" article) is featured here with the dress-up portion. Children are able to try on clothes in "grandma's attic". Description: As the front cover states, "a workbook and history of fifteen folk-art toys, crafts, plays and stories from the Collection of the Boston Children's Museum." 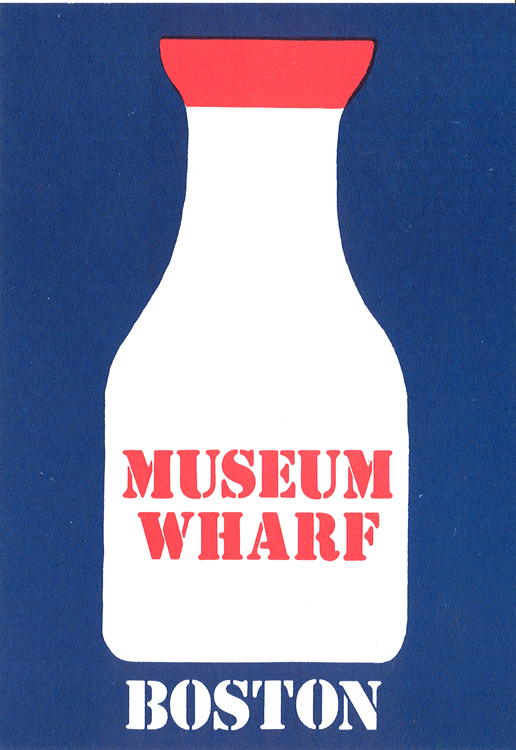 Written by the Museum's head graphic designer, Edie Kraska. Description: Children play in the Grandparent's Living Room Exhibit, part of Grandparent's House, which is part of the City Slice exhibit. Description: BCM staff members have fun preparing photos to be used in the museum. Description: This flyer announces Greek festival day with activities including storytelling, dancing and games. The second page shows the flyer in the Greek language. 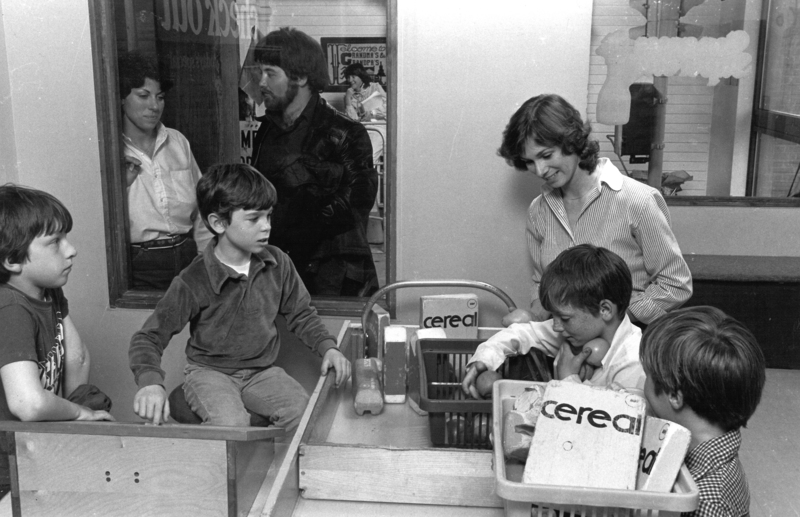 Description: A group of children and adults gather in the grocery store exhibit. 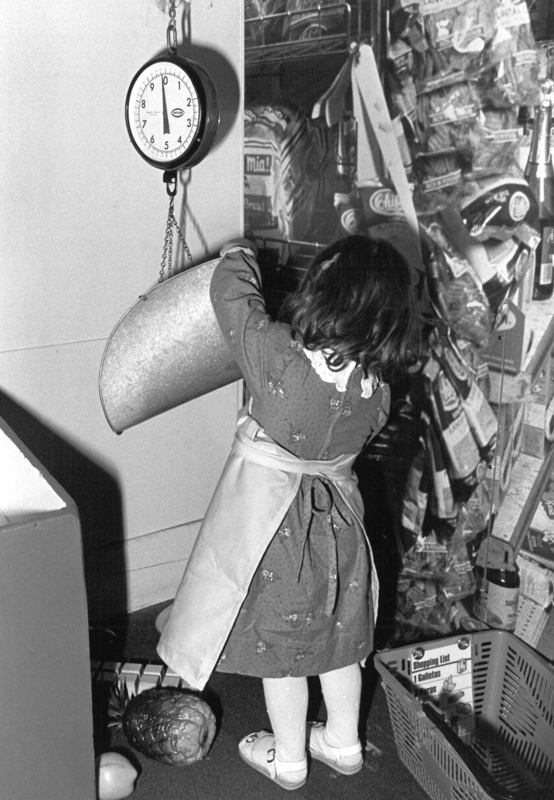 Children could shop for plastic versions of food and pretend to check out as well. Description: When attempting to find a new location for BCM, Mike Spock and the other board members went through a number of potential choices, the few that were high up on the list were scrutinized for all necessary working features including ease of access for potential patrons. A variety of images are an example of the research that went into what was almost BCM's new location, the Hancock Pavilion. 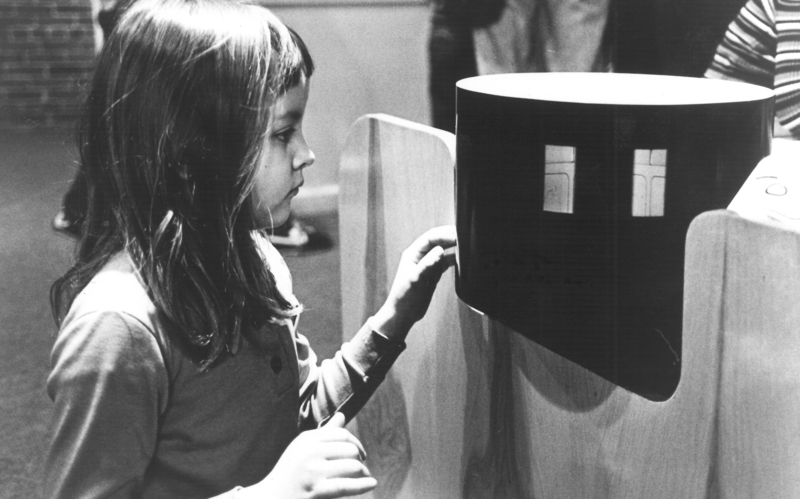 Description: A little girl makes sure to closely examine the movie exhibit to see how it works. 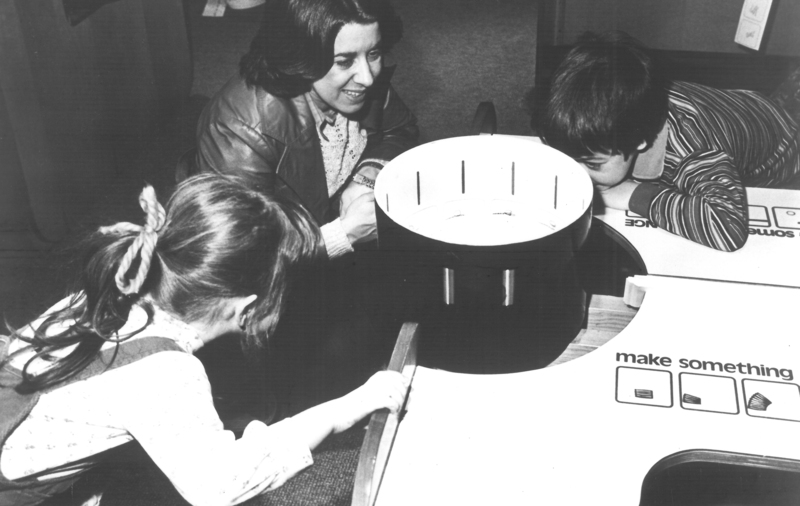 In the "How Movies Move" exhibit, zoetropes allow children to make their own animations. 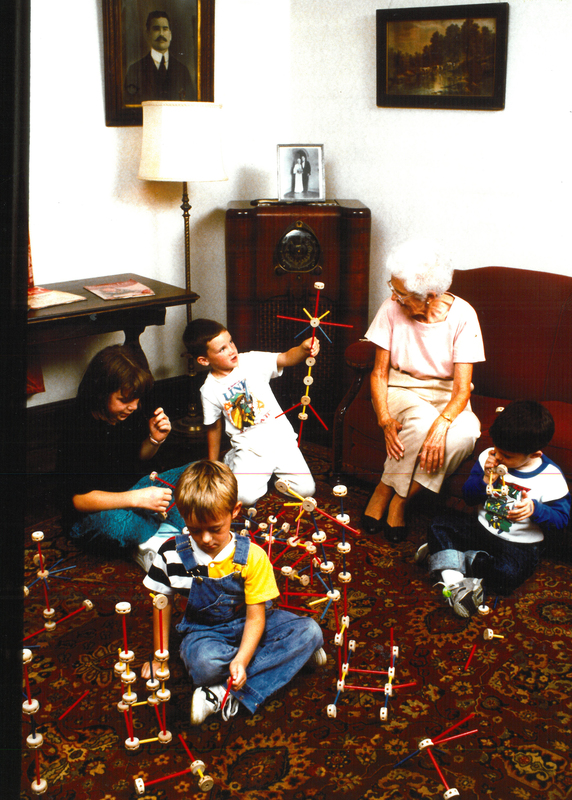 Description: An example of how the structure of BCM grabbed the interest of children and adults alike. In the "How Movies Move" exhibit, zoetropes allow children to make their own animations. Description: A close up photo on the spinning animator on the How Movies Move exhibit and a little girl who is examining it. Description: This flyer describes the arrival of a million LEGOs to BCM. Included is the descriptions of two exhibits that showcase fun designs with LEGOs, as well as describing puppet show Sundays featuring the Gerwick Puppets. Description: A history report detailing income and expenditures from 1960 until 1975. Research done and actions taken relating to the economic stability of the museum are listed. Description: Elaine Gurian, the head project manager for BCM's move, writes an article for the American Association of Museums entitled, Institutional Trauma: Major Change in Museums and Its Effect on Staff." In it, she describes in great detail how the move from Jamaica Plain to the waterfront Museum Wharf location changed even the smallest things for staffers, like getting the mail. Description: March is the month covered in this flyer, with a special focus on Irish-American heritage. Every Saturday the Meeting Ground exhibit hosts Irish music, dancing and folktales among other fun activities. Description: This five page document lists all the necessary general information such as how to get the Museum Wharf, what their number is, and what their hours are. This information bulletin also includes all of the exhibits and financial and budgetary information. Description: A flyer announcing the Japanese New Year celebration at BCM. Description: Jeptha Wade, a lawyer involved with Boston museums, talks about how his work with BCM stemmed from a life-long love of museums. Description: Jim Pitts talks about his long-time involvement with BCM and his role as treasurer and board member. Description: John Bok, chairman of the Museum Wharf Project Committee, talks about how Dan Prigmore's expertise positively affected BCM's move to the Museum Wharf. Dan Prigmore describes how his experiences with non-profit work and how he used this to help the project. Description: Interview transcript with Jonathan Hyde. Hyde, who was head of public relations for the move from Jamaica Plain to the downtown site, explains here his experience with trying to make the goal set in place for the anticipated rise in the number of visitors attendence. Description: Advertises the corporate membership program at BCM. A list of the variety of programs and services offered by the highly interactive museum are listed, along with how giving would benefit the museum and a list of current corporate members. Description: A two page, detailed description of BCM's Corporate Membership Program. Topics covered are the Museum's background and story up to the relocation to the Wharf, the benefits of joining - for both members and the Museum - and a sheet to sign up and apply. 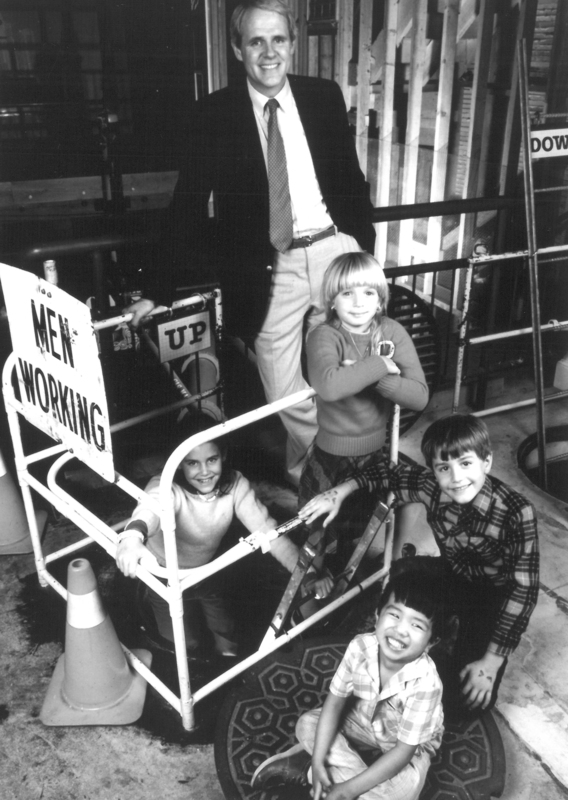 Description: Mike Spock poses for a photograph with a group of his museum-goers at the manhole exhibit in BCM, part of the larger City Slice Exhibit. 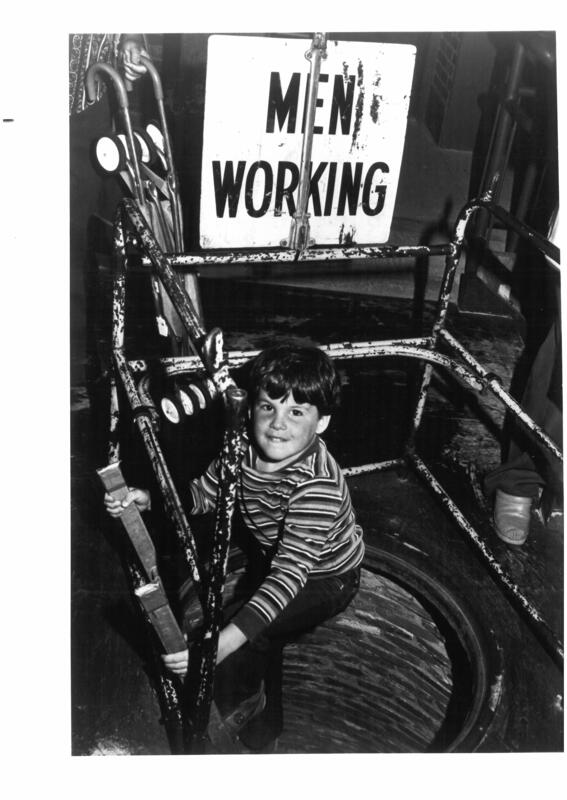 Description: A child gets ready to pose for the camera as he gets ready to explore the Manhole exhibit at BCM, part of the larger City Slice exhibit. Description: A list of what was on BCM's event calendar for the month of May. 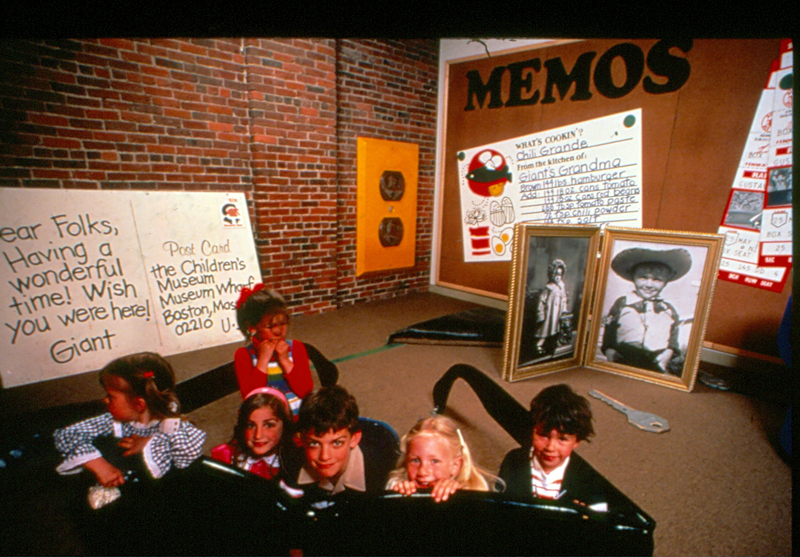 Description: An article written by"Hand to Hand: Children's Museum Network", features the 23 years he was director of BCM. It goes into how he got his start, how he addressed the audience, and really pressed the question of what should a Children's museum be, focusing on being interactive. Description: This flyer lays out all the events that happening throughout the entire summer in the year of its production. Jugglers, Puppet Theater, and educational activities are on the agenda. Description: This article titled, Museum Profiles: The Museum of Transportation & The Children's History Museum, Boston and printed in "Technology & Conservation's winter issue explores the newly moved museum from top to bottom. Looking at everything from the build BCM picked to how they spaced out their exhibits and how they utilize their staff and plans. Description: As the Museum Wharf was beginning to come together, the finishing touches included putting a nice coat of paint on some of the walls. 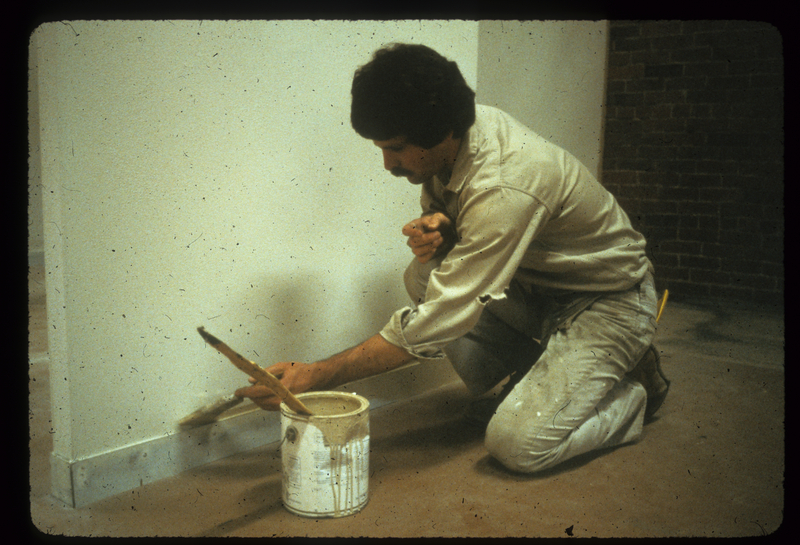 Here Ed Grusheski, who was a museum educator at BCM, does his part. Description: A photograph of the back the Museum Wharf and the fire escape. The building, built in 1888, was originally a wool warehouse. Description: The multi-leveled Museum Wharf interior is shown, as well as the Children's activity center. Description: Aerial photograph of the Museum Wharf with the Hood Milk Bottle in view. Description: An aerial photograph from the east looking at the Museum Wharf and waterfront. 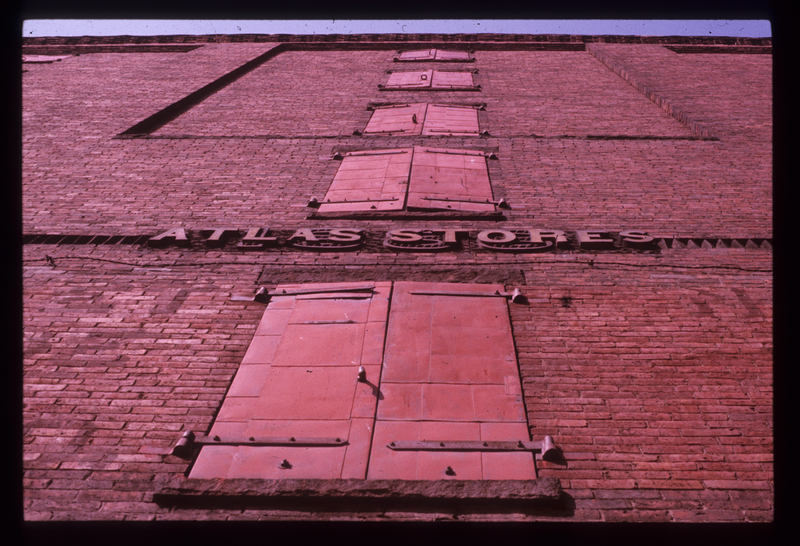 Description: A picture from the ground looking upwards on a building in South Boston saying, "Atlas Stores". Description: Shows the word "Museums" being painted onto the exterior of the new building. 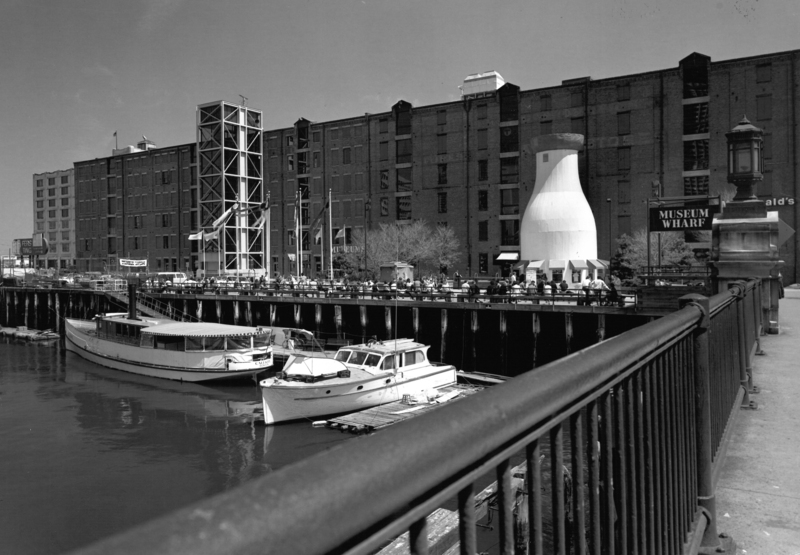 Description: A group of twelve images that show various angles of the Hood Milk Bottle, the iconic, recognizable landmark for BCM right on the waterfront in South Boston. Description: A number of drawings by Cambridge Seven Associates turned into photos here showcase different ways that BCM could layout the Museum Wharf in color coordinated diagrams. Description: The dedication program for the opening of the Museum Wharf location. An event with behind the scene tours, dedication remarks, and a reception. Description: Pre-addressed envelope for people to send to BCM. The new Museum Wharf addressed is used. Description: A map of the Museum Wharf location and surrounding South Boston. Directions by car and subway are described. The map itself shows streets and points out visual landmarks such as the Hood Milk Bottle to help one navigate. Description: A fact sheet by the Boston Children's Museum, this handout explains the who, what, when and why of BCM's decision to move. Details of expanding exhibits and the last planned day at the Jamaica Plain site are included. 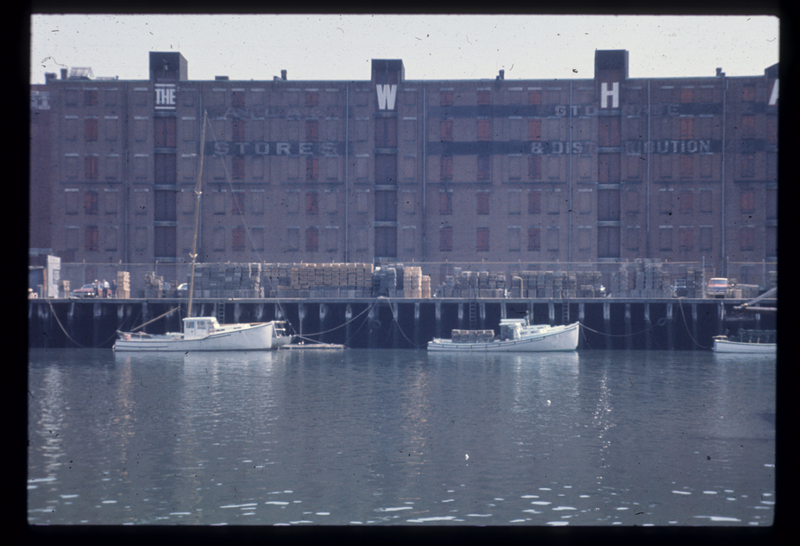 Description: An aerial photograph showing the Wharf building in South Boston. Description: A picture of the waterfront from the viewpoint of Fort Point Channel. You can see the beginning of "The Wharf" being spelled out on the building in the background. 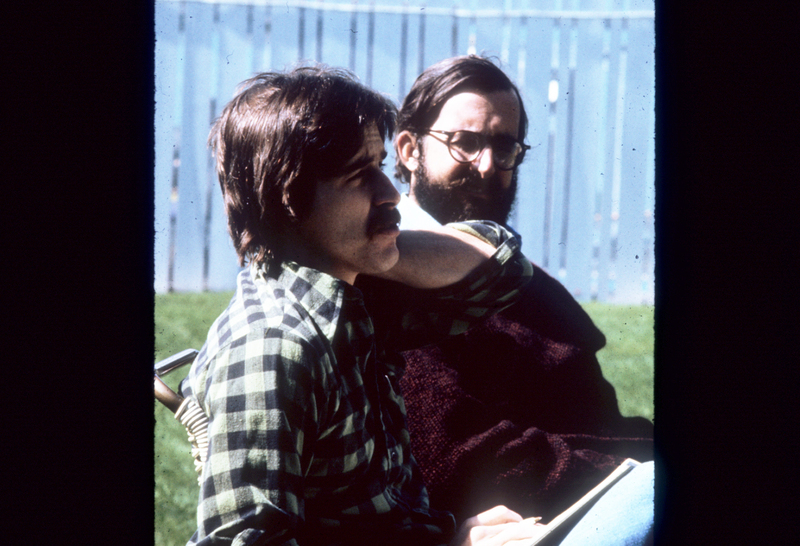 Description: A photograph from the Museum Wharf's retreat featuring Andy Merriel and Chuck Redmon sitting and chatting. Description: A series of nine photographs that show vividly, the thriving downtown community of South Boston and the waterfront location BCM had chosen to build its new location at. A number of exterior shots including the water and Hood Milk Bottle give context to the area while interior photos allow all to see the beautifully refurbished warehouse. Description: A series of pictures created by Cambridge Seven Associates to show a model of what the interior of the new Museum Wharf location could look like. The Museum of Transportation's section is showcased as well. 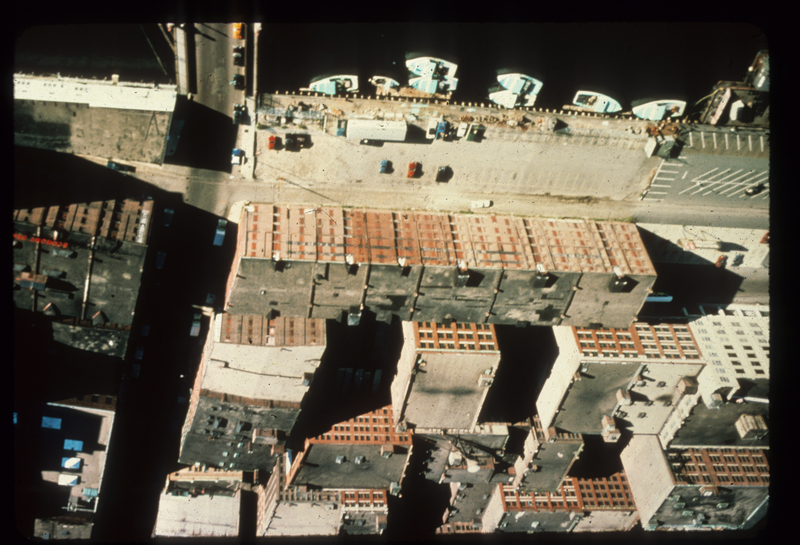 Description: A collection of seven photos of aerial shots of the Museum Wharf site and Fort Point Channel in South Boston. Description: A series of photographs that show various angles of models made for the plan of the new BCM location. 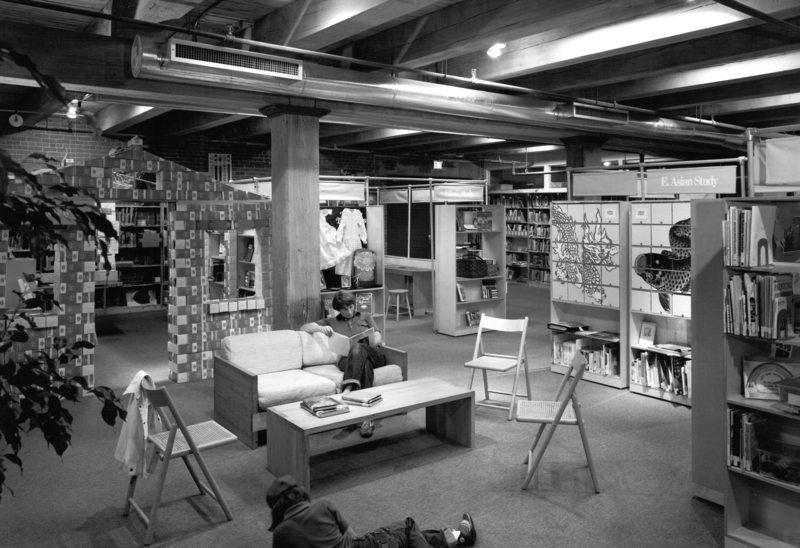 Cambridge Seven Associates worked closely with BCM to repurpose an old warehouse that became the Museum Wharf. 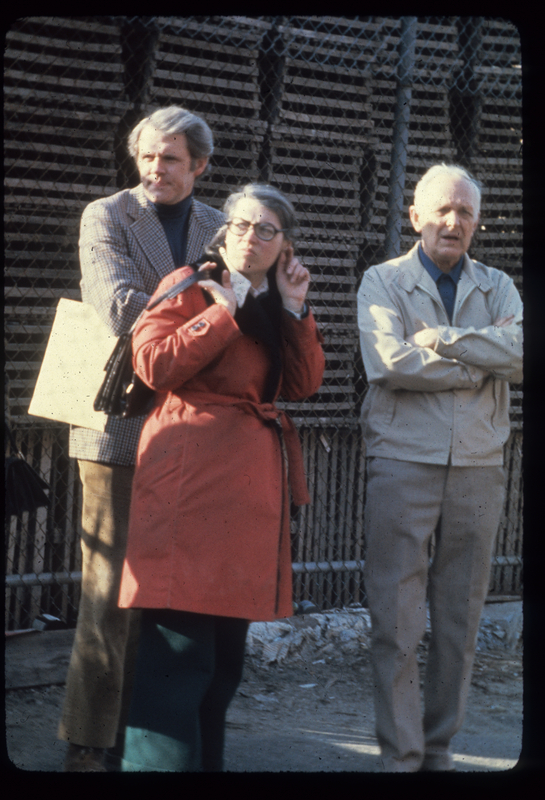 Description: Mike Spock and Dottie Merrill are shown here on a visit to what would become the new Museum Wharf site. 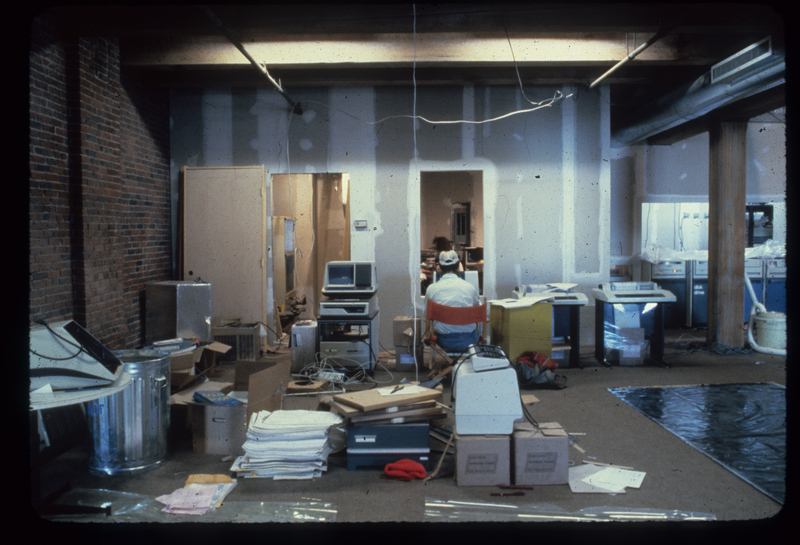 Description: This picture shows the interior of the new Museum Wharf location, the utilization of the existing warehouse architecture is showcased, as well as a portion of the sizes exhibit. 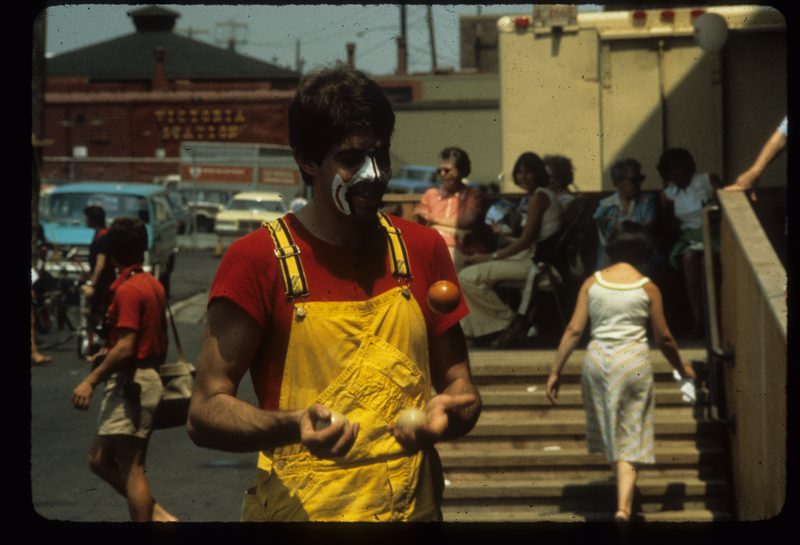 Description: A juggling performer is the focus of this photograph. BCM always had something fun going on and especially took advantage of its new, more central, location in South Boston accordingly. 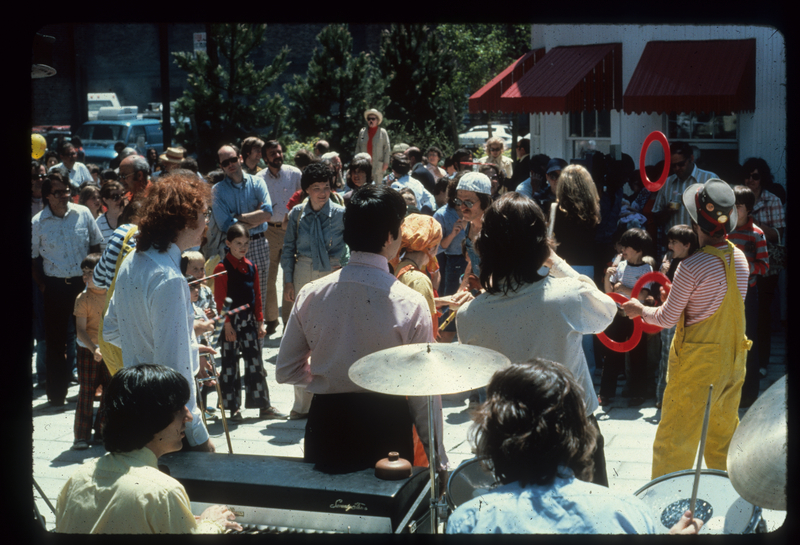 Description: Music, jugglers and the famous Hood Milk Bottle are all featured in this picture of a performance in front of the Museum Wharf in the summer. 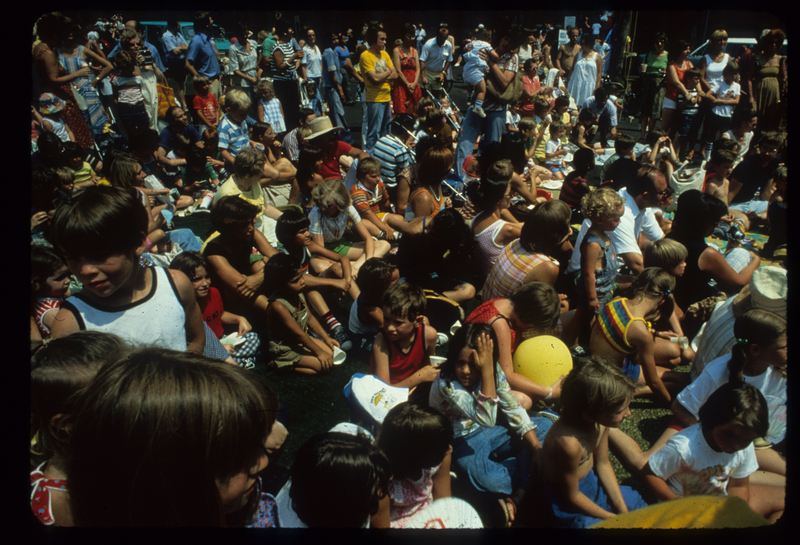 Description: A group of children and adults alike gather outside the Museum Wharf to view one of BCM's many entertaining performances. Description: A proposal by McMillian Inc. for the addition of the Apron. BCM wanted to expand and utilize its waterfront location and, as the proposal begins with, "compliment the already successful indoor Museum experience." The proposal goes into detail on how it would be completed and designed. Description: A wide shot photograph showing the Museum Wharf in the background along with the Hood Milk Bottle, and the lovely waterfront location. 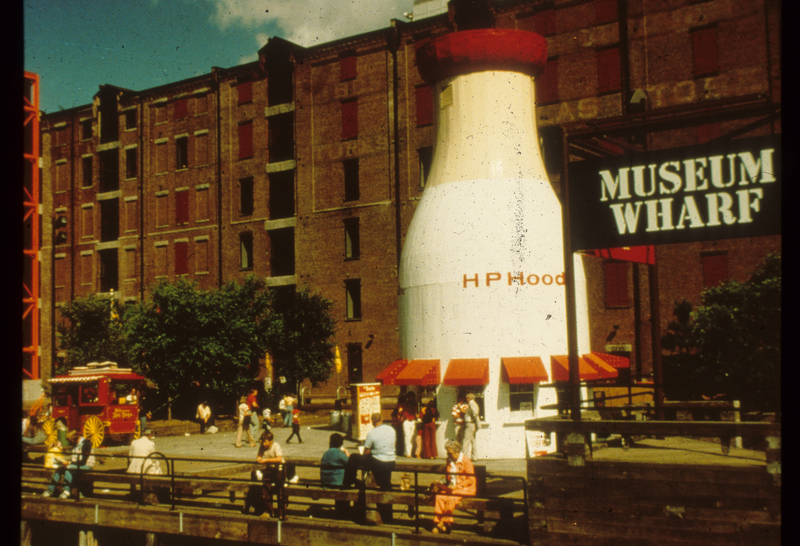 Description: The famous Hood Milk Bottle in front of the BCM Museum Wharf site. See how it came to be at this location in the interview titled "Story of the Hood Milk Bottle". Description: Traffic directional sign for the Museum Wharf. Attached to posts around the South Boston area, these helped get the word out for the new location. 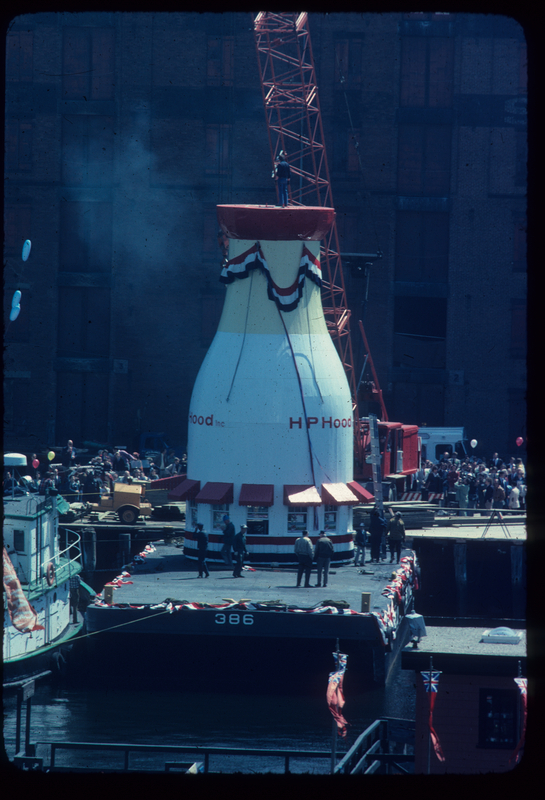 Description: A photo of the famous Hood Milk Bottle being delivered onto the Wharf waterfront. 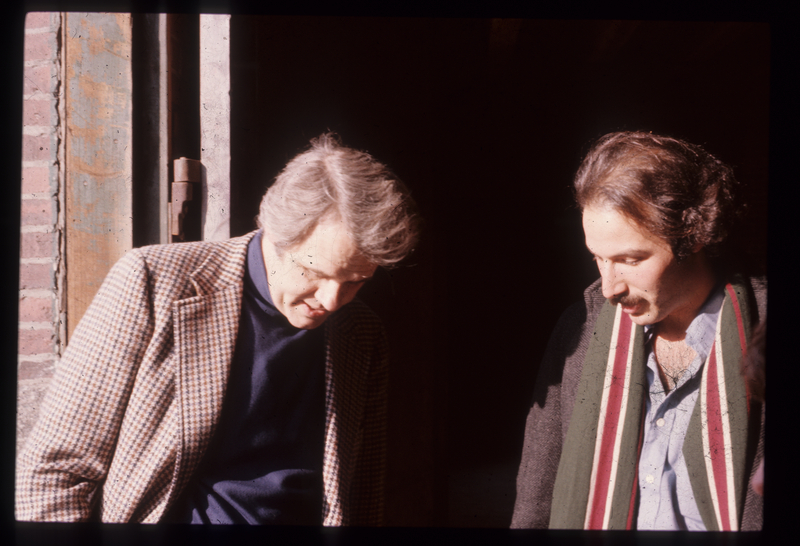 Description: Mike Spock and Jim Zien stand at one of the bay doors in what would become the new Museum Wharf location of BCM. 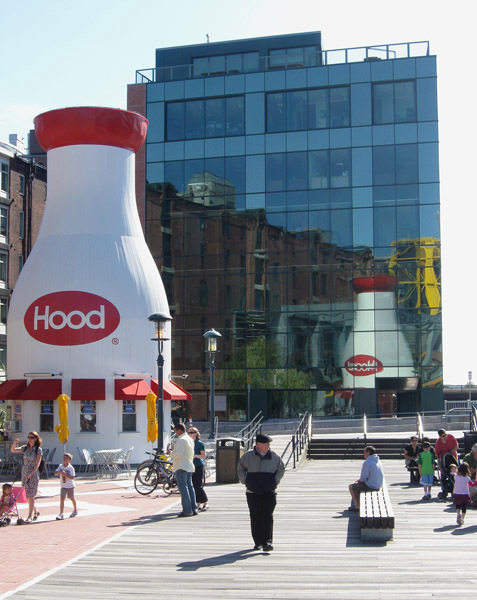 Description: A photo of the Hood Milk Bottle as it sits on the waterfront near the Museum Wharf. Description: Boston Children's Museum director, Mike Spock is featured here in this portrait style photo showing him at the new Wharf location. Description: This undated postcard has what was the new Museum Wharf address listed with "Children's Museum" prominently displayed. 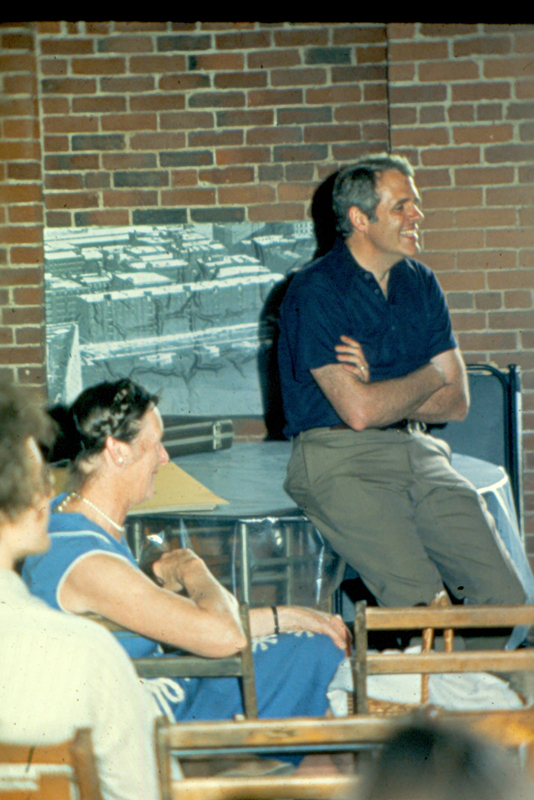 Description: Mike Spock and Sue Jackson are featured in this photograph of a planning session for the impending move from Jamaica Plain to the Museum Wharf. Description: This file is home to eight photos that show the Museum Wharf in detail. Photos range from very close shots of the exterior ornamentation, to a wide shot of the Museum Wharf looking from out in the harbor. Description: Shown in this file are three hand drawn diagrams of the proposed Museum Wharf floor plan. Highlighting and notes are made to show suggested ways of design. Description: A collection of 17 photos showing the beginning stages of the construction on the Museum Wharf's visitor center. An architectural drawing is also featured. 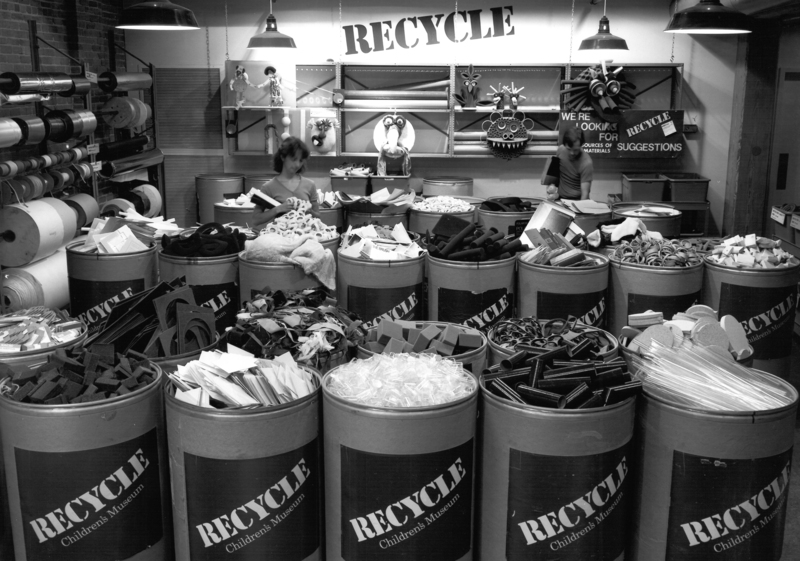 Check out this chapter's story to read more about the recycling of materials! 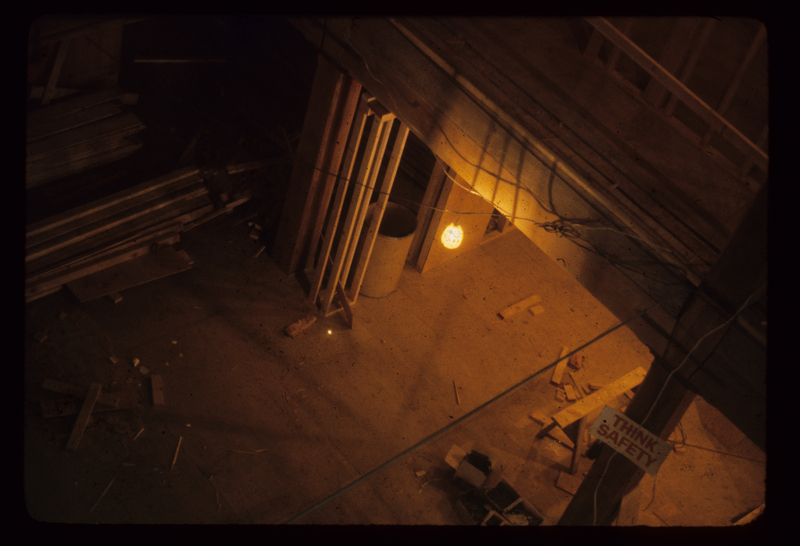 Description: A photograph of the Museum Wharf warehouse renovation and construction. 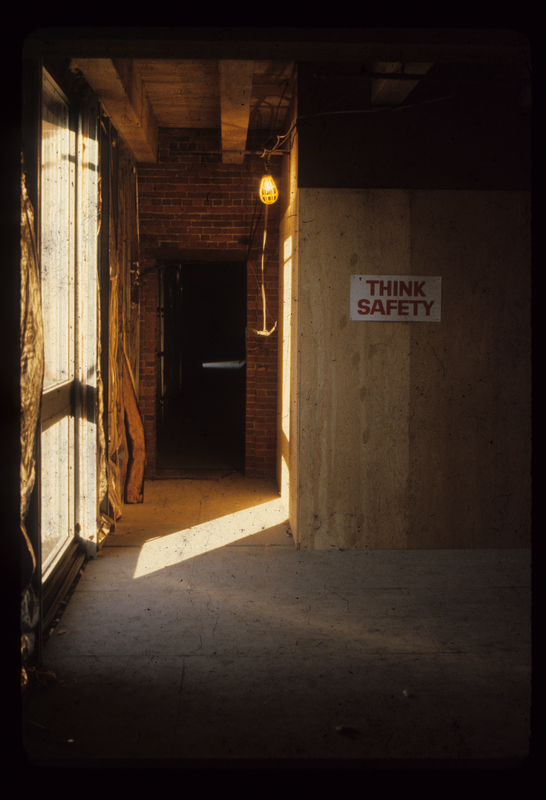 A sign announces for all the "think safety", a good motto for a Children's museum. Description: This photo shows all the fun to be had on the waterfront location of the Museum Wharf. 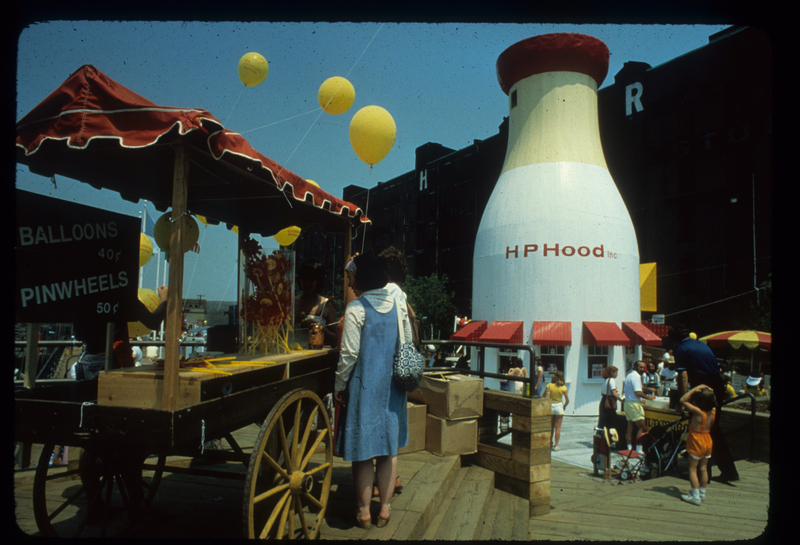 Shown is the Hood Milk bottle, the Wharf in the background, and the fun carts in the foreground. Description: Mike Spock, and two other BCM staff members visit the Museum Wharf site. 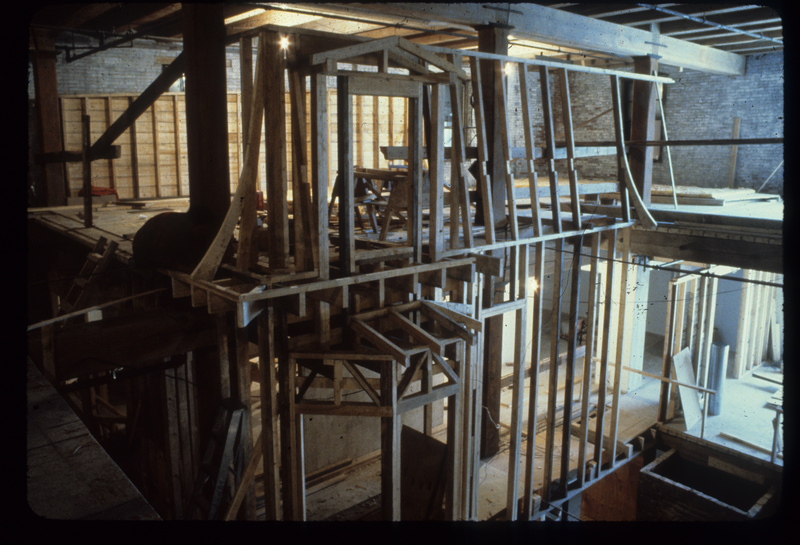 Description: A gutted interior of the Museum Wharf shows the place in a state of renovation and construction. We can see that some boxes of documents and some computers that have started arriving in their new location. Description: A temporary fundraising outpost stationed in two bays at the Museum Wharf. Description: "Two dynamic and growing museums have run out of usable space" one bolded sentence remarks on the fourth page. This proposal lays out everything a potential skeptic would need to know to be convinced that BCM's move to the Museum Wharf would be economically viable, and that both BCM and the Boston community would benefit from having the museum downtown. Description: Article in Museum News, Challenges Confronting Museums Vol 48 No. 8. written by Mike Spock. Featured in the April 1970 issue of Museum News, this article lays out ideas that Spock proposes to help museums work together on a regional level so they can face tasks such as fundraising together. 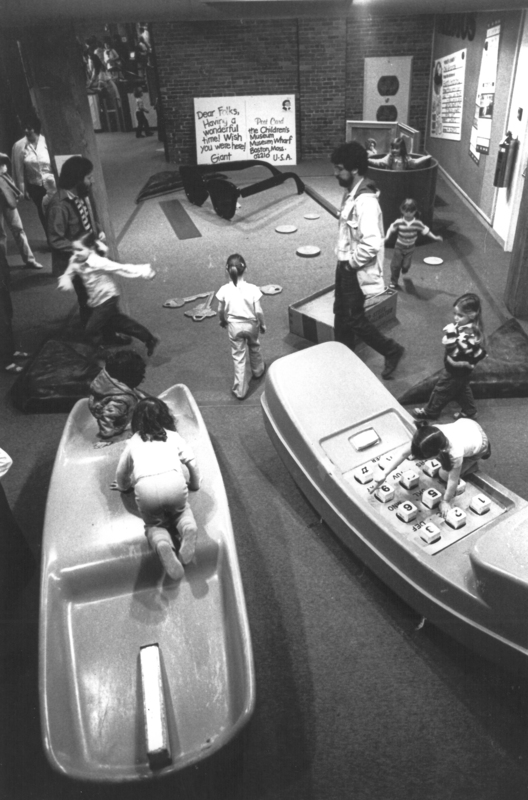 Description: With the tagline, "Children at Work", this exhibit featured play structures, a water gallery and a measuring arcade. 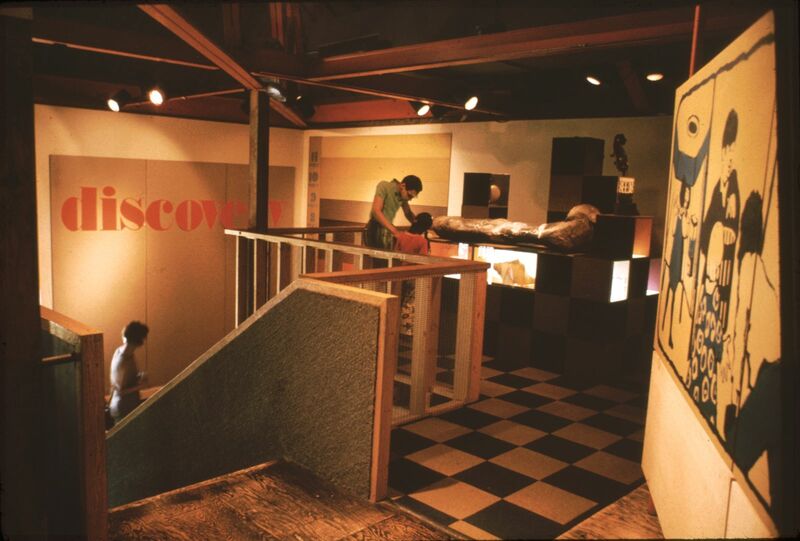 While this exhibit was primarily meant for preschoolers, this photo shows that the sprawling design allows for parents to have room to explore too. 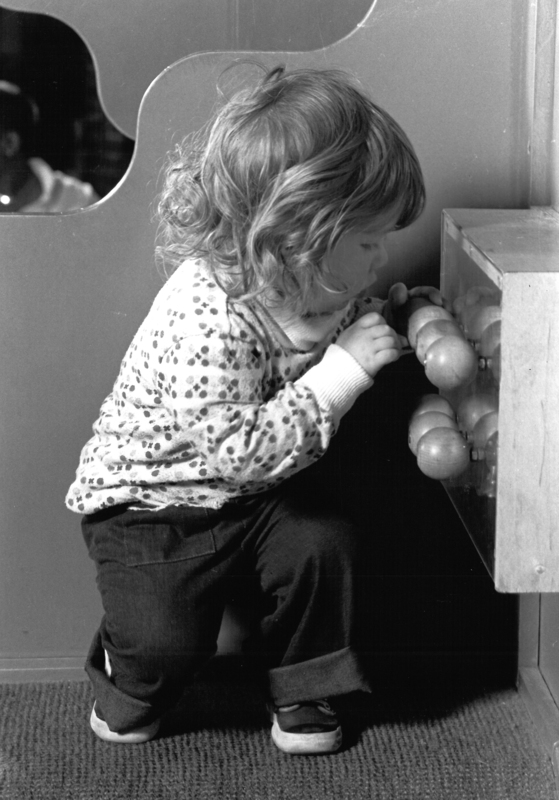 Description: A little girl plays within the Playspace exhibit at BCM. While each exhibit was tailored as being interactive for children, each on had general age groups they were tailored for. 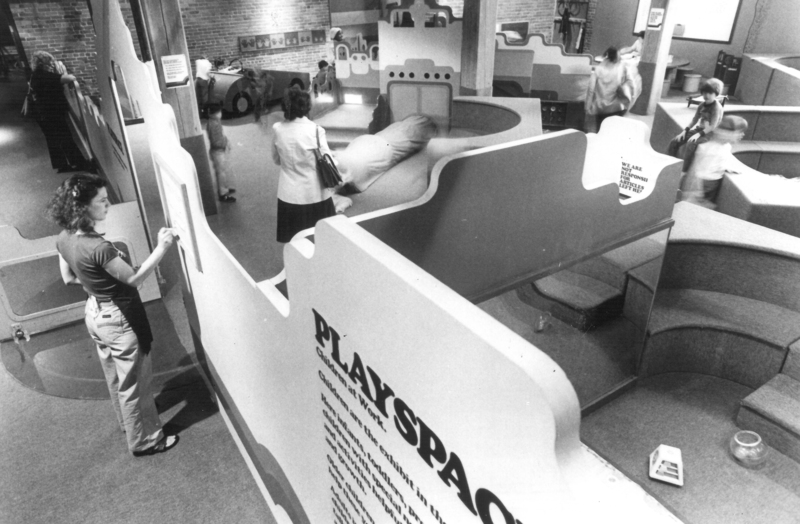 Playspace was tailored for preschoolers. Description: The crew of BCM, who had been hard at work setting up and building exhibits, takes a well earned break. Description: Created for the proposed renovations and additions, not necessarily just for exhibit space, as this report points out. The newly added space would create space for an "Adventure Center", a cut out to the outside so visitors can enjoy the waterfront, and the renovations would upgrade the restrooms and lobby. Floor plans are pictured. Description: This report, originally for the Program Committee, goes into elaborate detail about the architectural changes for the new BCM - everything from how the layout will be, down to how many more square feet each section of the museum would get. Drawings and sketches are included. Description: A flyer showcasing the puppet Sundays triumphant return in January and February, additionally with Saturday shows in March. The schedule, times and museum info is also listed. Description: The Jewish festival, Purim is celebrated by BCM. This flyer indicates the activities and workshops offered throughout the day. BCM and the Jewish Community Center of Greater Boston cooperated on this festival. 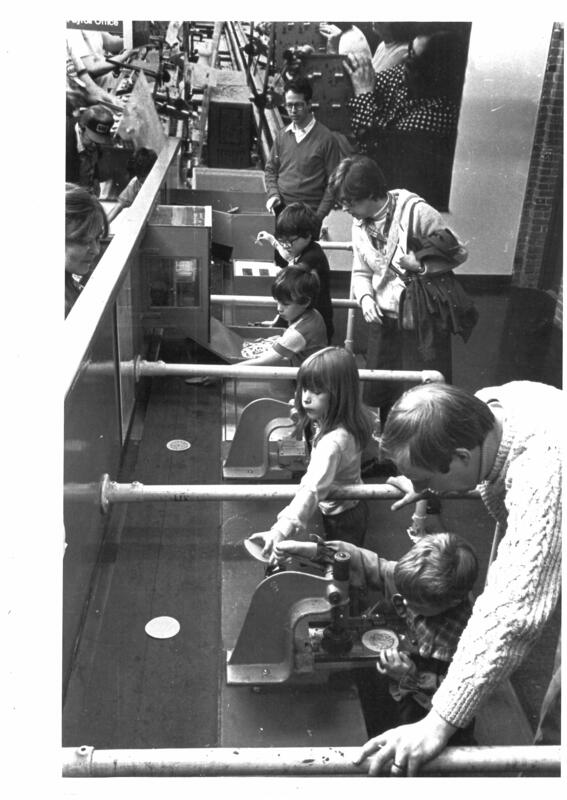 Description: A group of children watch in anticipation as they interact with the Raceways exhibit, watching ping pong balls speed down their respective lanes. Description: A photo of the barrels of industrial by-products like wood, paper, and plastic parts are sold to the public by BCM so they could be used in arts, crafts or science projects. Description: Fully titled, Renovation Survey for the Security, Collection Storage & Climate Control Systems for the Congress Street Wharf, this article describes in specific and meticulous detail everything about the potential new location renovation from space, to the location to expanding the museum's public impact with the Wharf. Creator(s): Boston Children's Museum; Cambridge Seven Associates; Dr. William Young; Joseph C. Chapman, Inc.; Museum of Transportation; R. J. Vanderweil Engineers, Inc. 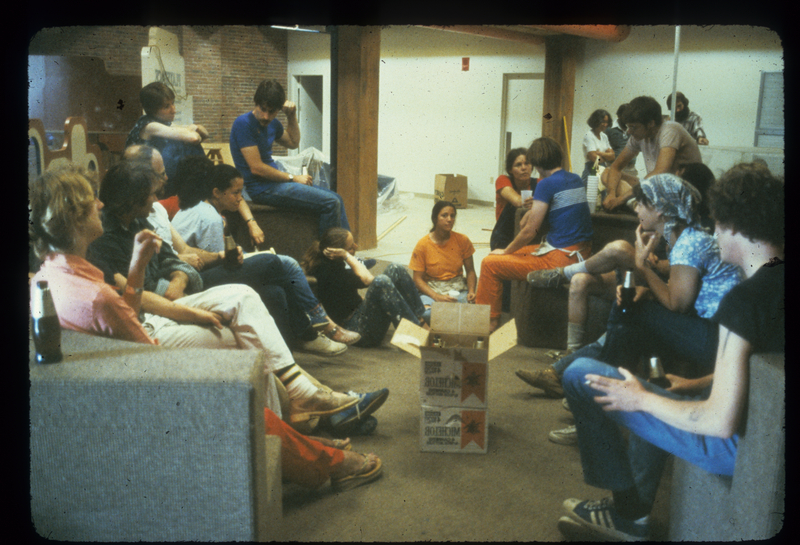 Description: A photo of the Resource Center inside BCM. The RC was the hub for all things hands-on learning with access to kits, exhibit related materials, activities, and was the host of many of the education and entertainment events that went on at BCM. Description: This brochure, sent out to the public in the Boston area, details the facts about BCM, the accolades from People Magazine and the Smithsonian, and explains what one gets when they become a member of the Museum. Description: A fun, informational brochure that explains all the facts about BCM, from the where it is, how they break up their annual budget, and how one could become a member. Mention from Smithsonian on the front states BCM was, "changing the meaning of the word museum". Description: A flyer listing Sunday events at BCM. Start times and cost of admission are included. Description: A draft of chapter 10 table of contents marked with suggestions. 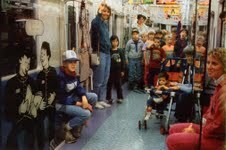 Description: Photograph in color of teenagers on a subway car at an exhibit entitled 'Teenage Tokyo: Youth in Popular Culture'. 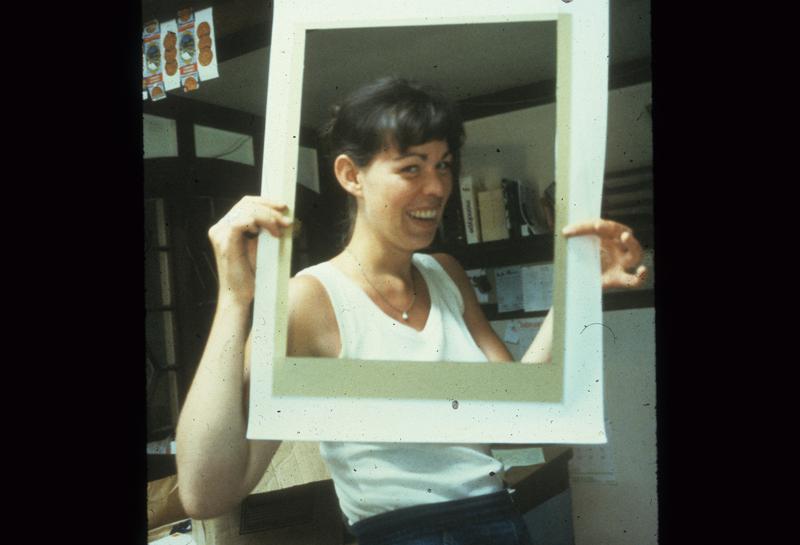 Description: Photograph in color of a visitor at the talking board in the Teenage Tokyo Exhibit. Description: General Wharf updates are available to anyone who would like to grab a copy of the newsletter. Banking business, general fundraising and announcement of new exhibits are listed. Description: A fun chart depicting the different ways gifts and grants were collected to help fund BCM. Description: In the third issue of volume 3, this Museum Gazette talks about a new exhibit that was dedicated, fundraising task forces and some events mentioned in flyers such as "February Vacation Week" and "Toddlers Take Over". Description: This edition of the Museum Gazette announces the completion of the Museum Wharf purchase by BCM, fundraising announcements, and some new members of BCM's board. Description: Volume number 3, issue number 4 of the Museum Gazette describes news and updates circulating the Boston Children's Museum. A staff member's newly published book, a spring celebration and newly allocated corporate funds are some of the features. Description: This issue of the Museum Gazette includes the announcement of the newly elected officers at BCM, updates on the buyout of the Museum of Transportation's portion of the Museum Wharf, and the upcoming Decemberfest. Description: This issue of the Museum Wharf Gazette talks of fundraising accomplishment and news, as well as new exhibits. A mention of Mike Spock's guest role on Good Day Show is also included. Description: The official announcement of the Museum of Transportation's departure from the South Boston waterfront venture is mentioned, as well as news of new grants, new exhibits and the arrival of 1 million Lego pieces. Description:This article in People Magazine does a feature on Mike Spock and his work transforming BCM into what they dub, "the country's best museum for kids". Description: As this first issue describes, the Gazette was published biweekly to help keep friends and staff abreast of all the new events going on the Museum Wharf. This particular issue talks about the announcing of MOT to be in the Wharf and its coverage in the local news. It also mentions of a new committee that was formed to promote communication between the two museums, and news of the Annual Meeting and a visit to the yet unopened Wharf. Description: A succinct yet informative fact sheet put out by both BCM and the Museum of Transportation. The who, what, when, where, why and how of the project are laid out. Description: The entire month of April here is dedicated to a series of programs for and about toddlers. Music concerts, plays and workshops are all on the agenda. Description: A brochure listing all the places with what are called Luckey climbers. With a motto of "safe and crazy" they were a hit in many kid's museums and malls. This pamphlet shows installations by date, it's no surprise BCM was first, at 1985. Creator(s): Luckey & Co., Inc. Description: This fun and colorful flyer shows some examples of interactive exhibits children can enjoy at BCM. Directions, hours and admission costs are included on the backside. 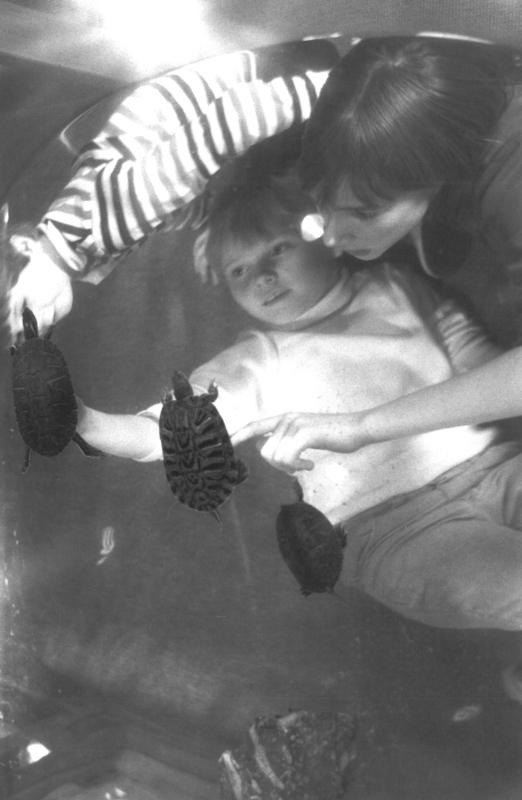 Description: A photo showing a mother and her daughter enjoying the turtle pond exhibit, part of the larger Living Things exhibit. 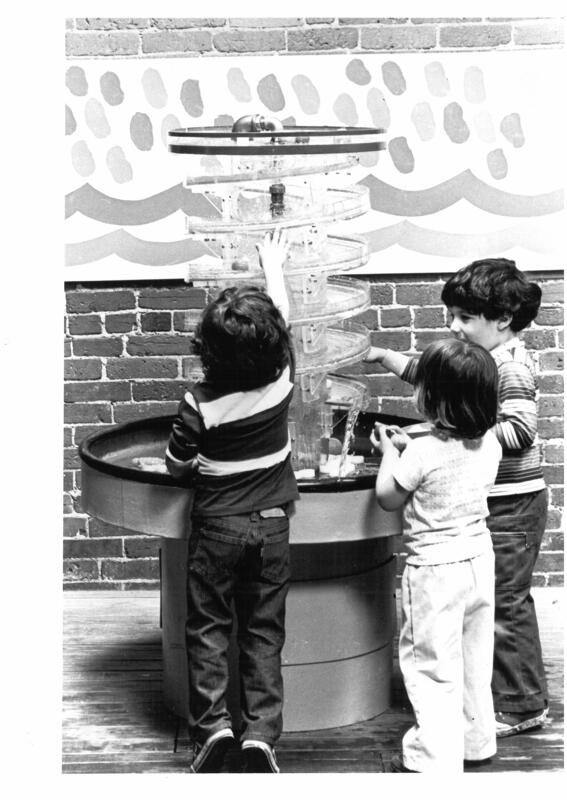 Description: This photo shows three children play in a fountain that was a part of the Waterplay Exhibit at BCM. Description: A detailed and annotated floor plan for BCM. It gives brief descriptions of what exhibits are where and what they entail. A second page, titled. "What's Up?" let's people know what activities and events are going on during the dates listed. 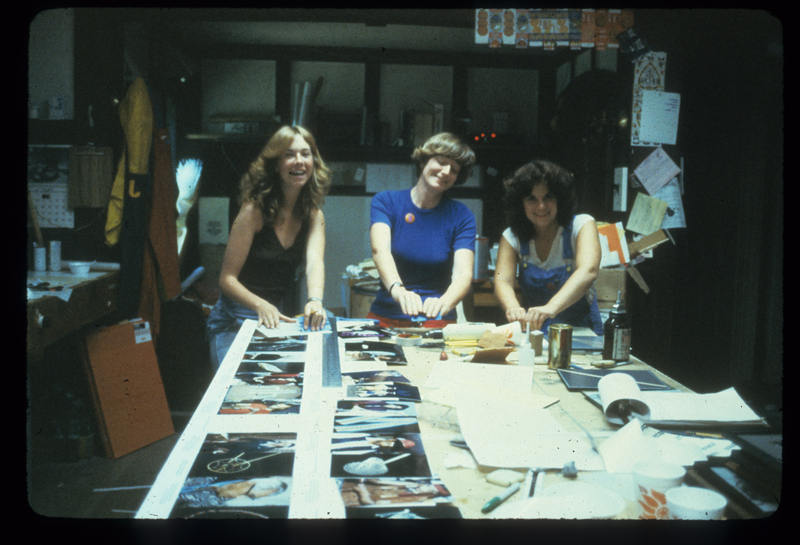 The slogan, "Kids keep changing; so do we" is also featured. Description: A magazine for anyone looking for fun things to do in the Boston area. This particular issue features BCM, and mentions that October 1985 was "Museum-Goers month"! 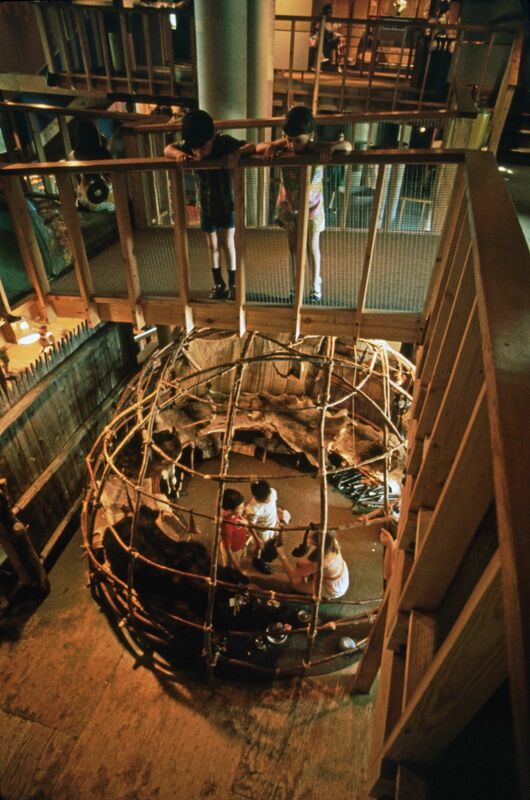 Description: Children enjoying the Wigwam Exhibit are shown here. Many of BCM's exhibits have multicultural themes. 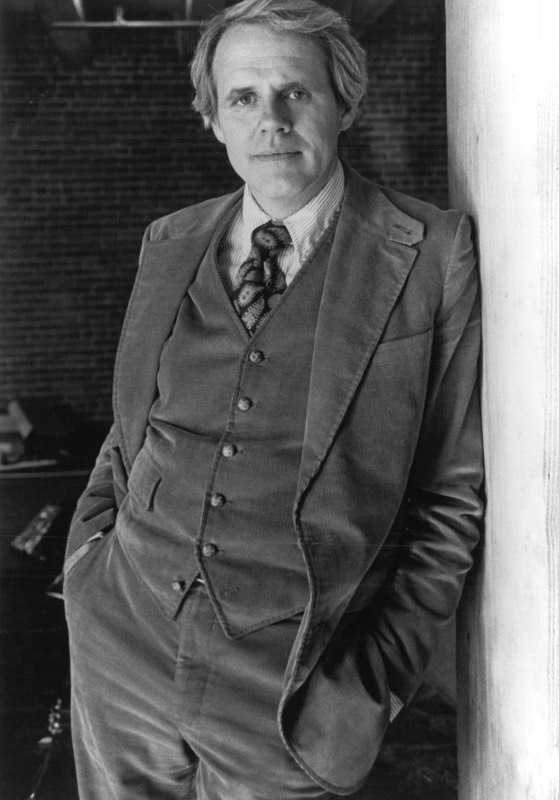 Description: John Bok, who was chairman of the Museum Wharf Project Committee, is interviewed about the transition from Jamaica Plain to the downtown Museum Wharf location. He talks about what it meant concerning logistic changes as well as the new ways they could be accessible to their audience. Description: John Bok elaborates on all his experiences working through the move from Jamaica Plain to the Museum Wharf. From why the location was picked, to building a structure that was good for children and also collaborating with people or groups like the Museum of Transportation. 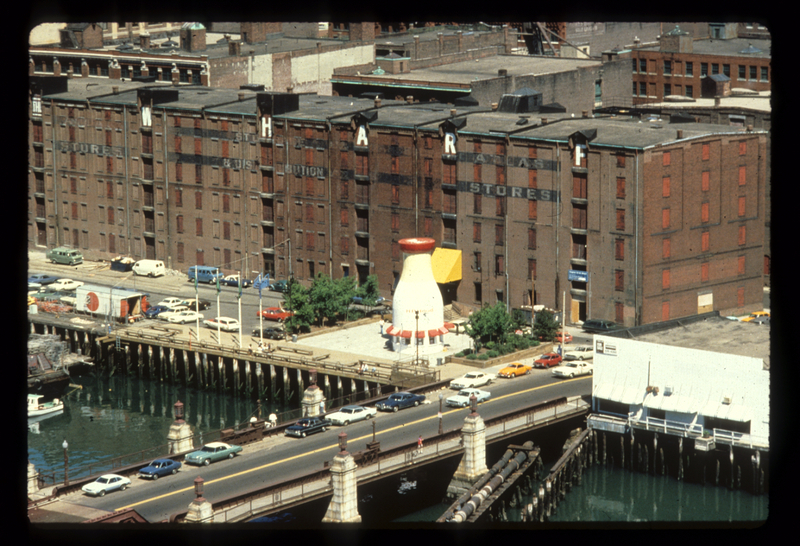 Description: John Sloan, Architect and City Planner, Duncan Smith, Museum of Transportation Director and Jonathan Hyde talk about the story of the Hood Milk Bottle and its circuitous route ending in front of the Museum Wharf. Description: John Stebbins, an architect hired for the Museum Wharf site, talks about all that it took to change an old warehouse into an operating museum. Description: Jonathan Hyde, head of public relations for the move to the Museum Wharf, explains his interactions with Captain Kangaroo and Mister Rogers during their visits to BCM.